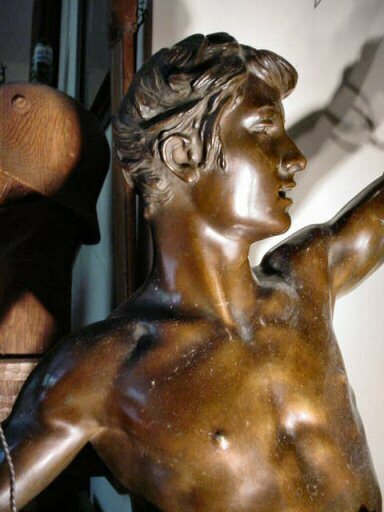 DESCRIPTION: First of all, let�s emphasize the size of this sculpture: This is a huge piece. 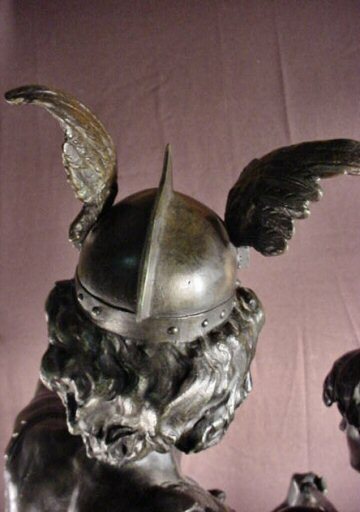 It measures 36 inches from the bottom of the base to the top of the warrior�s winged helmet. 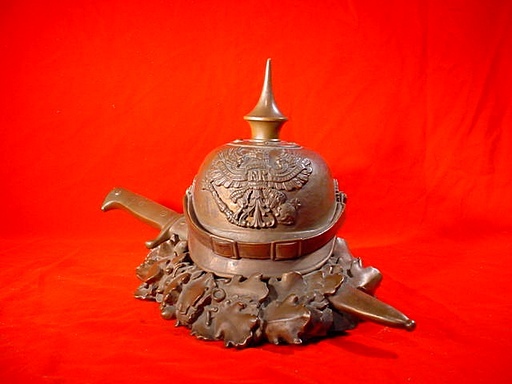 The base is 14 x 12 inches and is about 4 inches deep. 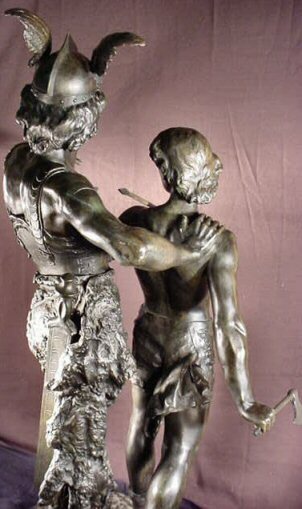 It takes two good, strong men to lift it. 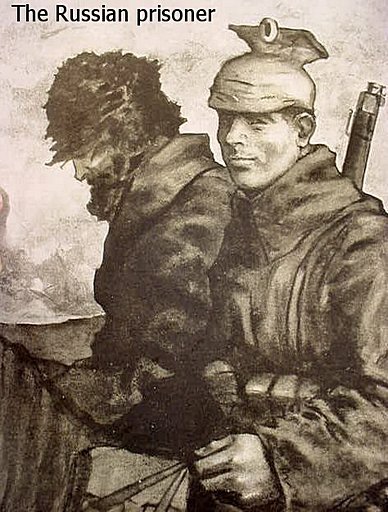 The masterful artwork is by Emile LaPort (1858-1907). 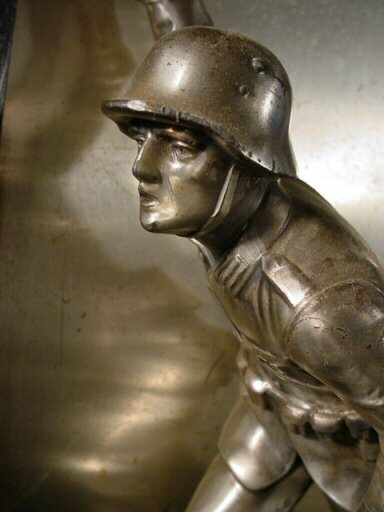 The name of this sculpture is �Pro Patria.� The foundry mark is Siot Decauville Fondeur Paris. 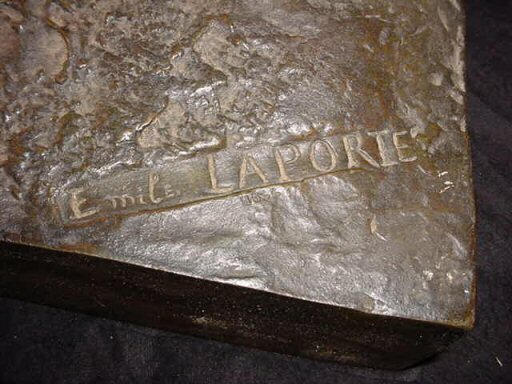 Emile LaPort was a genre/landscape painter and sculptor of renown, who exhibited at Salon from 1881 to 1906. 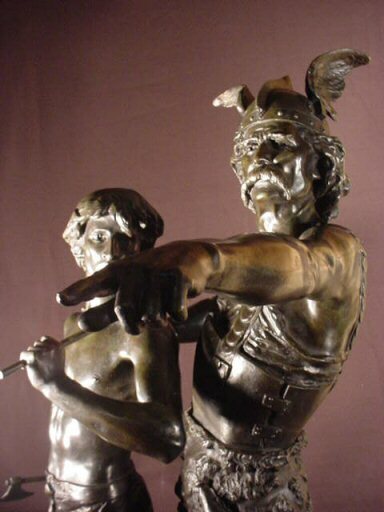 He sculpted �Pro Patria�/Gauois (Teuton) with Son, identical to Bonnardi�s Teuton and Son minus the sword on the son�s hip. 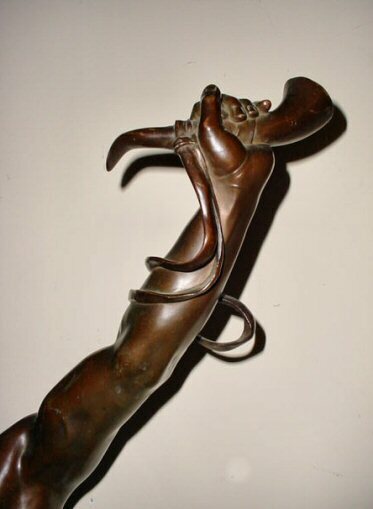 His works can be found in museums�Angers, Autun, and Tourcoing. 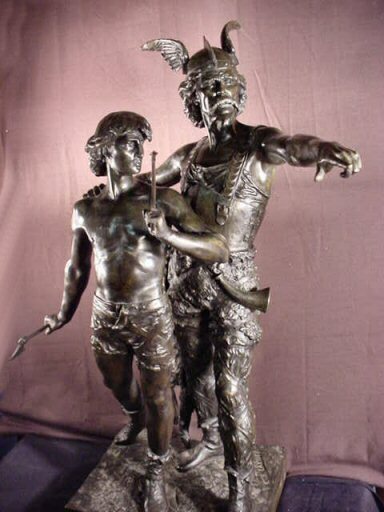 �Pro Patria,� the name of the sculpture, can be interpreted as �For Fatherland.� Yes, the Teutons were patriotic and this father as depicted seems to be teaching his son the use of weapons and the ways of war. 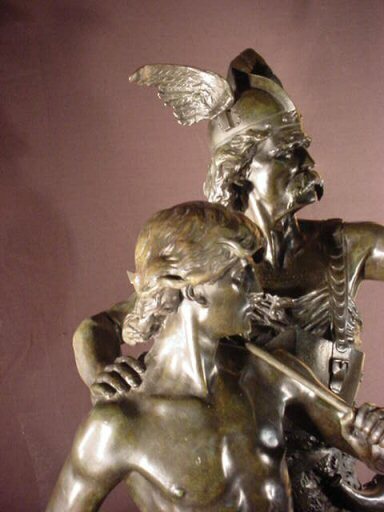 In the period when this sculpture was created the French seemed more inspired by the old Teutons and Gauls than the Germans were. 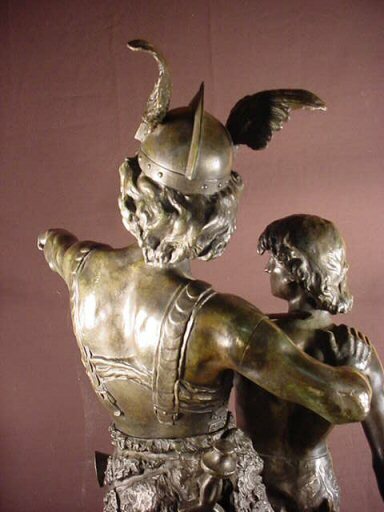 Thus, many of the best of the statues in bronze of Germanic warriors were produced in France. 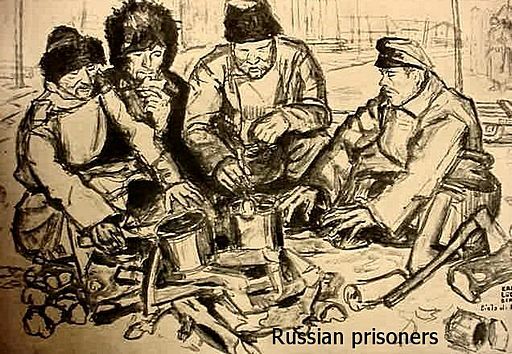 This study is by far the greatest of all such inspiring studies. 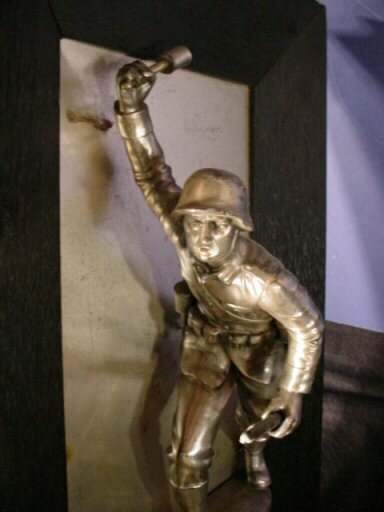 When one of these �Pro Patria� sculptures does rarely show up over the years, invariably it is missing the ax and spear that is carried by the young lad. 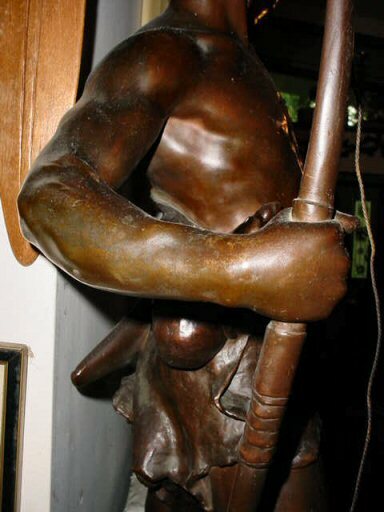 About 5 years ago we encountered one at an antique show in Miami Beach, Florida. 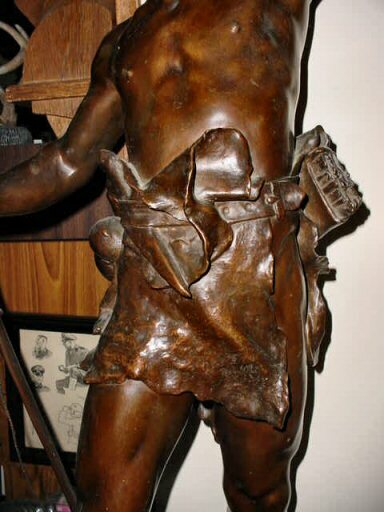 Not only were these mentioned appendages missing, but also the sword from the waist of the father figure was missing. 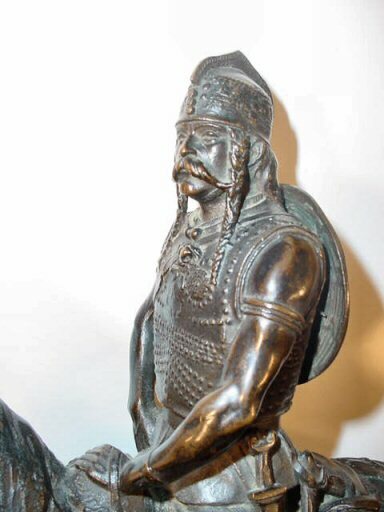 This sculpture is complete with all weapons and is in marvelous condition. 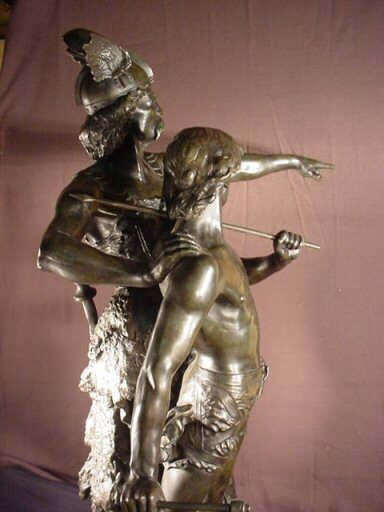 This is a highly dramatic depiction of life and high adventure among the so-called Barbarians of the Germanic forests and glades. 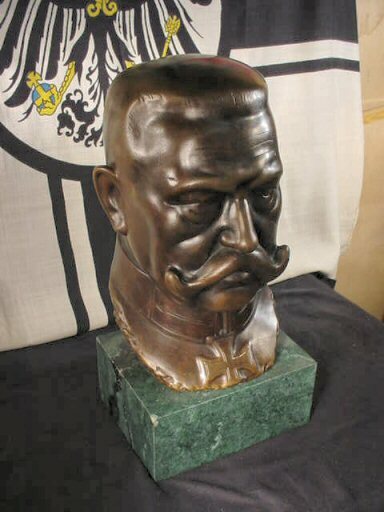 This is a museum piece personified, yet a cultured Germanophile would be more than proud and fortunate to count this masterpiece in his collection. 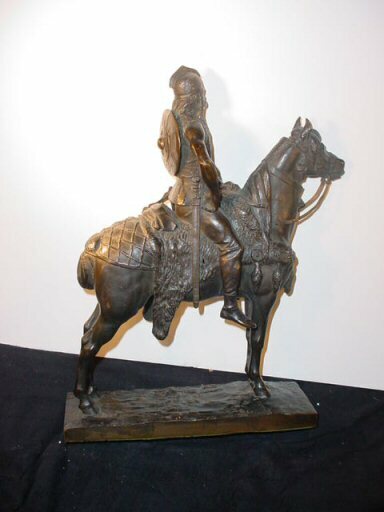 Action bronzes today are bringing huge prices at fine antique fairs. 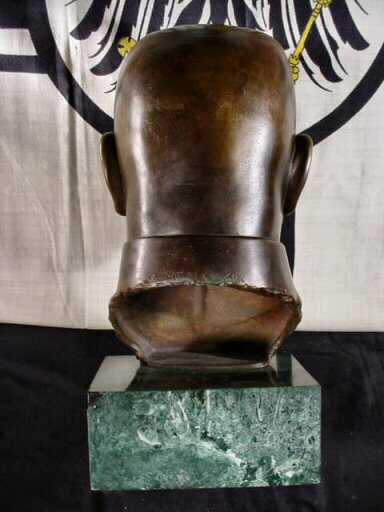 We are offering this the absolute greatest sculpture in this particular designated artistic expression at a very competitive price. 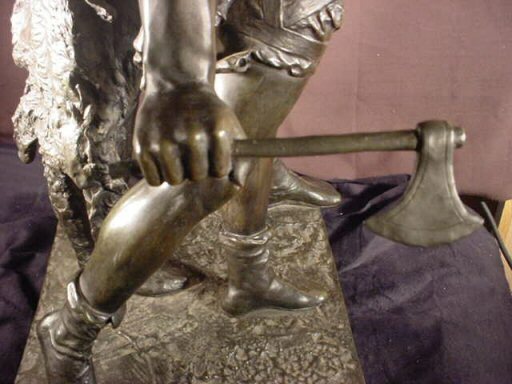 DESCRIPTION: This is a massive bronze sculpture of a Teutonic huntsman proclaiming the centuries-old announcement of the successful kill. 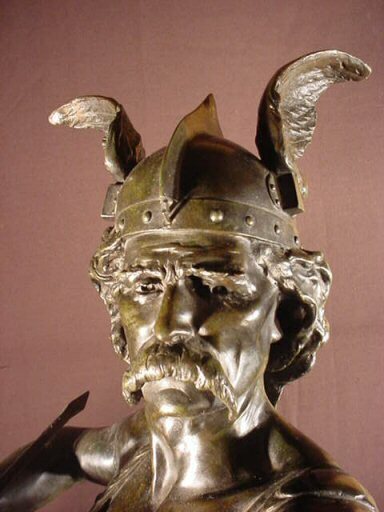 This is a typical Germanic theme in sculpture, but we have never encountered an example this large or this fine. 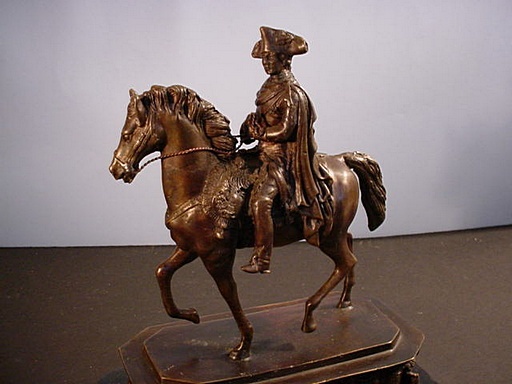 Here is bronze statuary at the zenith of perfection. 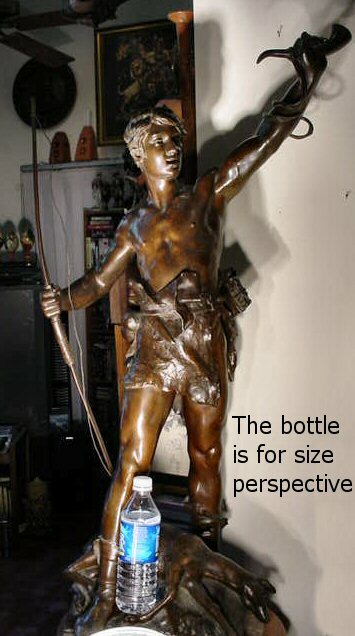 Big? Yes. 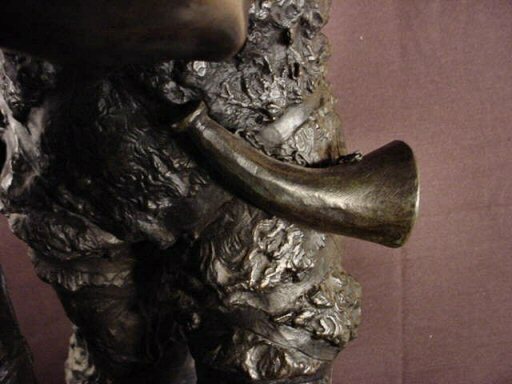 It measures 35 inches from the bottom of the base to the top of his head, and 40 inches from the bottom of the base to the tip of the hunting horn held aloft. 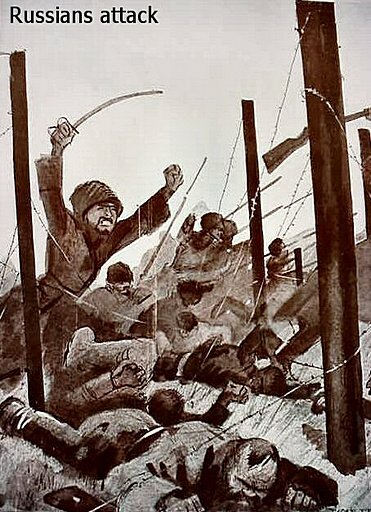 The slain animal measures 15 inches long. The base is about 11 x 11 inches. 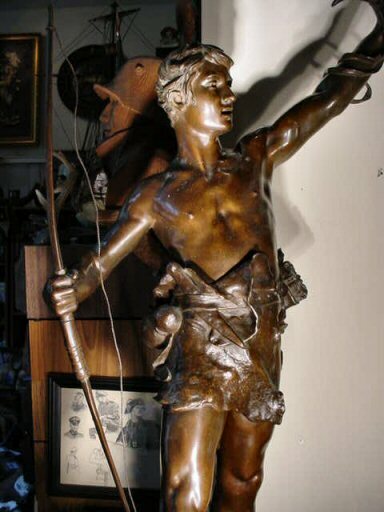 His bow is about 30 inches long, and naturally this is a very heavy sculpture. 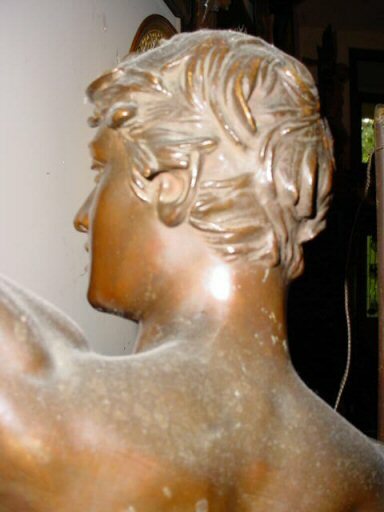 The soft patina is excellent; no casting holes. 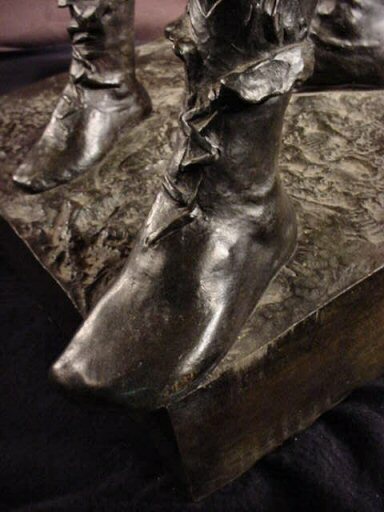 This is an excellent bronze sculpture. 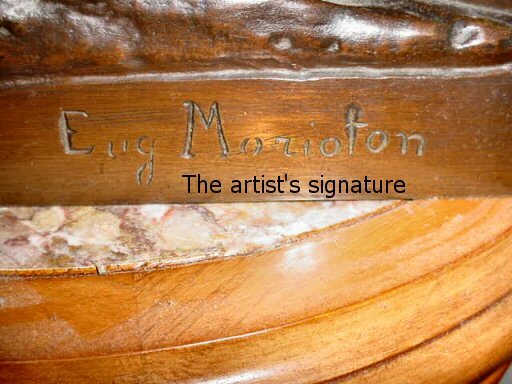 It is signed �Eug. 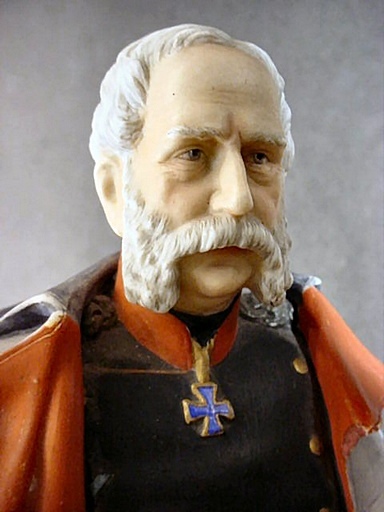 Morioton.� That would be Eugene Morioton, who worked in the 1880s in both France and Germany; an artist of note who specialized in action figures in Germanic and Grecian studies. 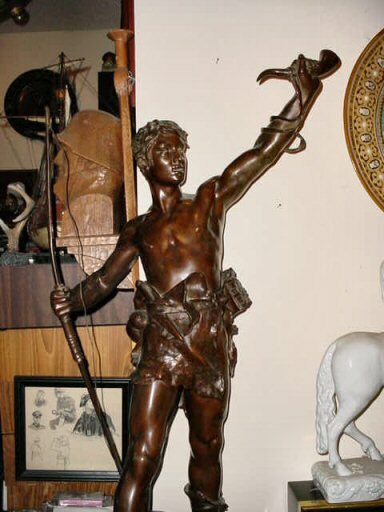 What is depicted so dramatically is the young hunter who gives the hunter a cry of �Hallali!� This is the German hunting cry given at the end of the successful hunt. 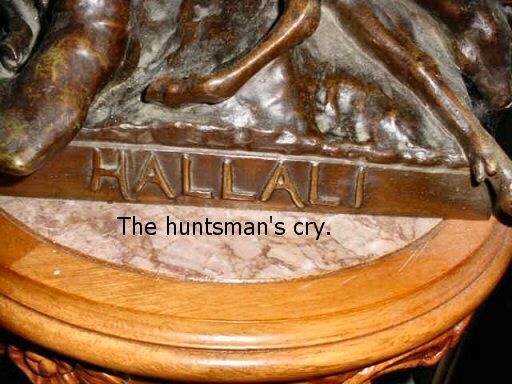 At the start of the hunt the J�ger call is �Horrido!� So �Hallali� and �Horrido� are mutually the �Waldmann�s call.� This hunter killed his prey with the bow and arrow he bears. 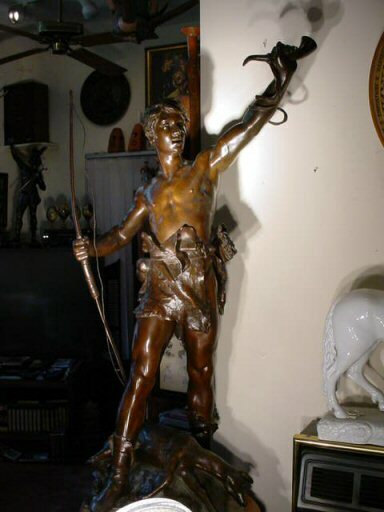 He also has his hunting horn with which he will summon the other hunters to tell them of his success. 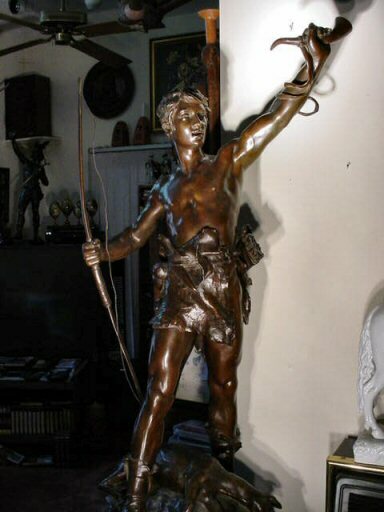 Have you ever thought of having that one ultimate bronze sculpture; that centerpiece that you can be deservedly proud of? 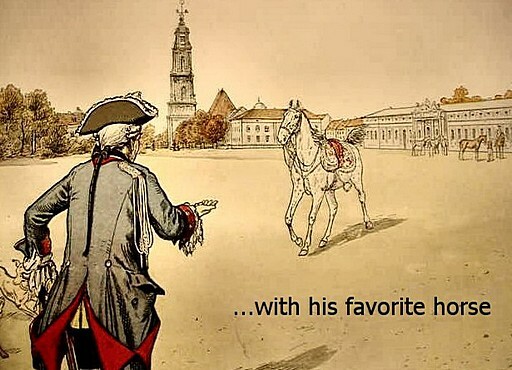 Here is the best! 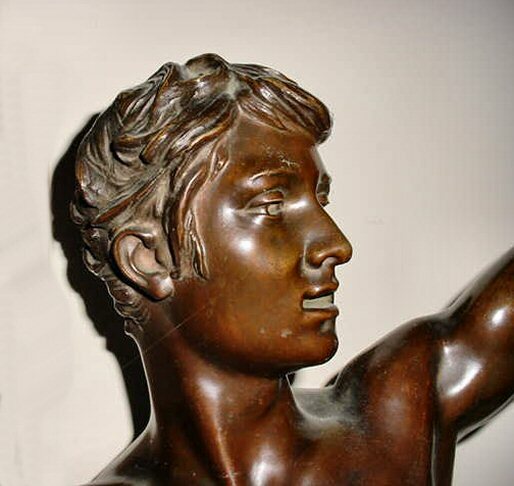 The price we offer it for would easily be triple that amount at a first-rate antique show or a Madison Avenue gallery. Here is great opportunity. Don�t miss it. 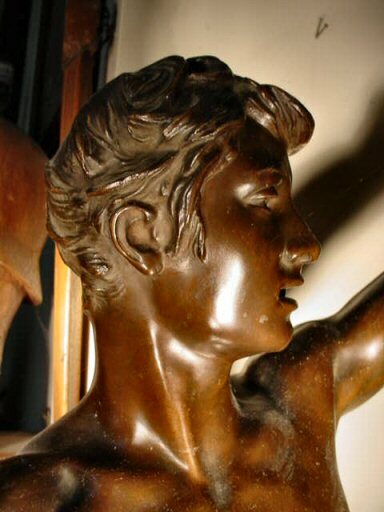 DESCRIPTION: This is a beautiful bronze executed by the famous French sculptor Emmanuel Fremiet (1824-1910). 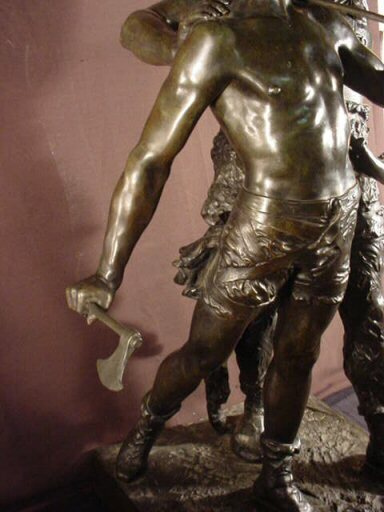 Fremiet was a nephew of Rude. 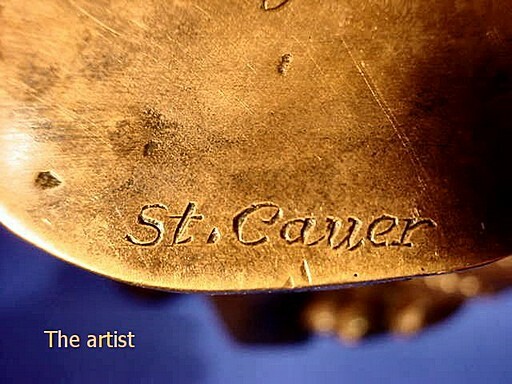 His first employment was drawing animals for the Natural History Museum. 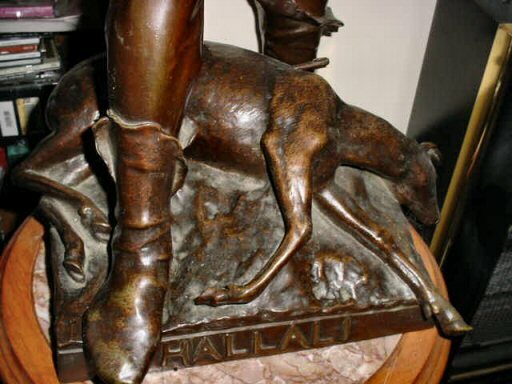 His family came to Paris from the country, a love for which is apparent in his early gentle animal sculptures. 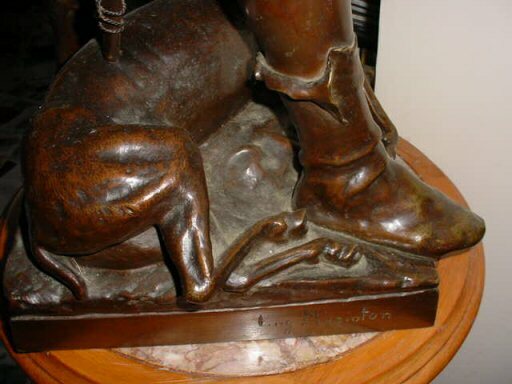 As he progressed and gained more state and private commissions than he could handle, animals took a secondary role in his groups. 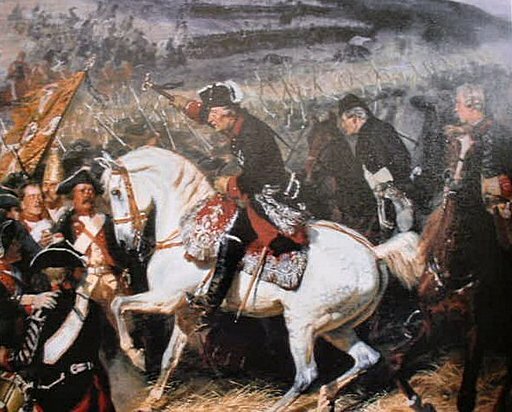 Yet, for all the pressures to produce he must be admired for his historically important figures and for his meticulous accuracy of uniform, armor, saddle, artists, etc. 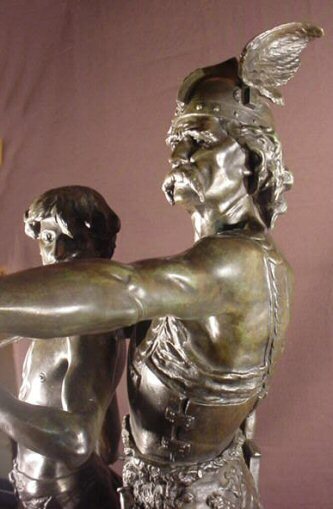 He was known for monumental figure groupings that can be seen in Paris and throughout France, and works such as this Gaul warrior were also produced and edited in reduced bronze editions. 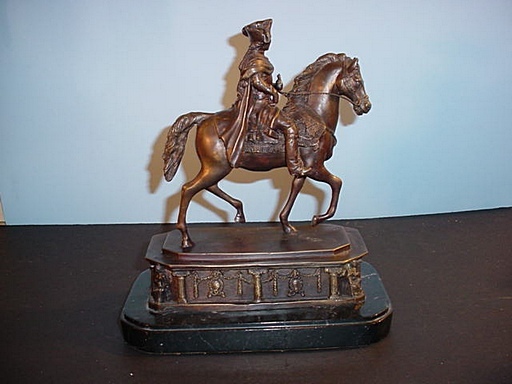 Fremiet�s great works and continued popularity make these mini monuments highly valued when found today. 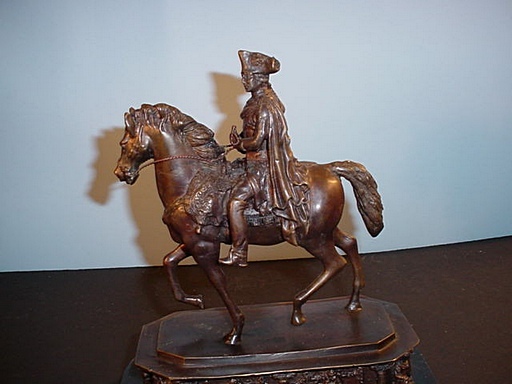 The bronze is in perfect condition except for the reins that are there but are disconnected at the holding end. This can be a attended to very easily. 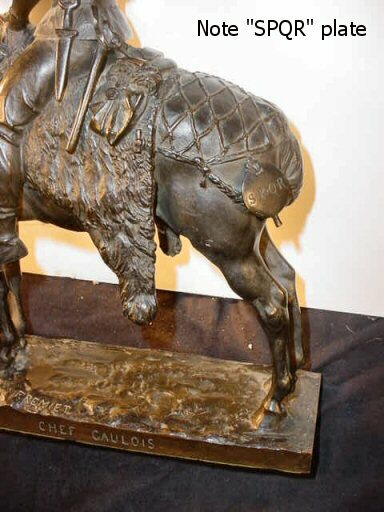 The name of the statue (engraved on the base) is �Chef Gaulois,� Chief of the Gauls. 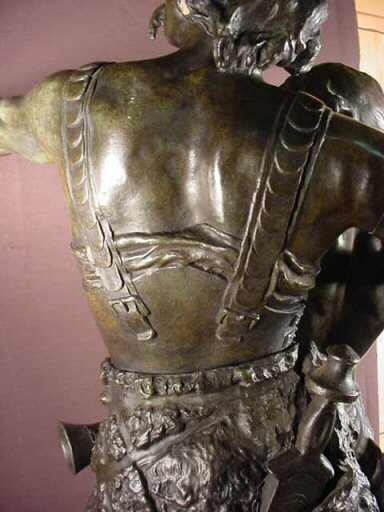 The wonderful sculpture has all the boldness of the heroic stance of the warrior leader. 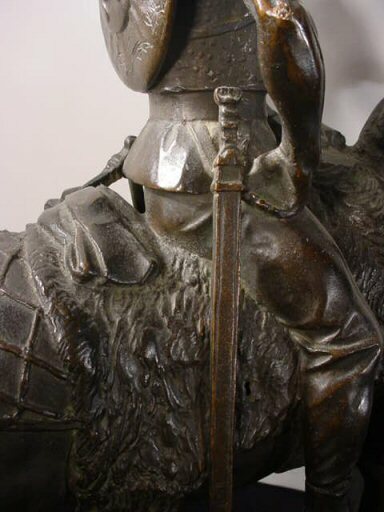 The armor on the horse and man, the weapons, and various accouterments serve to make this a beautiful and important art treasure. 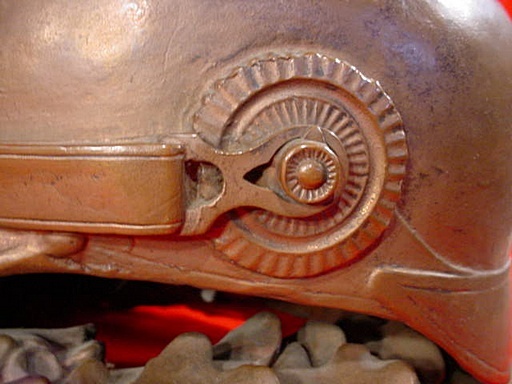 The measurement is about 15 inches from the bottom of the base to the top of the Gaulish helmet and about 11 inches from the tail of the horse to this now. 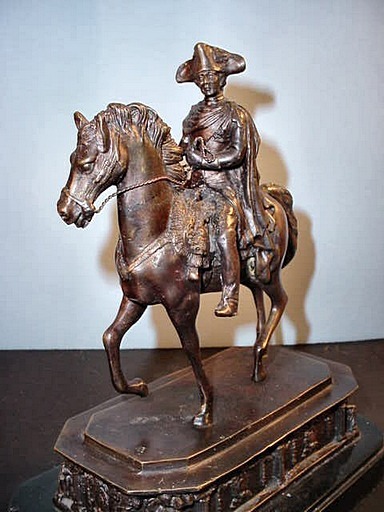 The chief by himself is about 10 a half inches tall in the saddle. 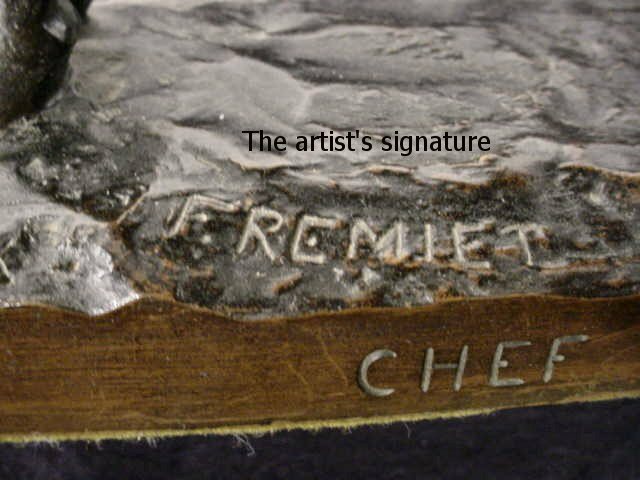 The sculpture is clearly marked Fremiet on a plate. 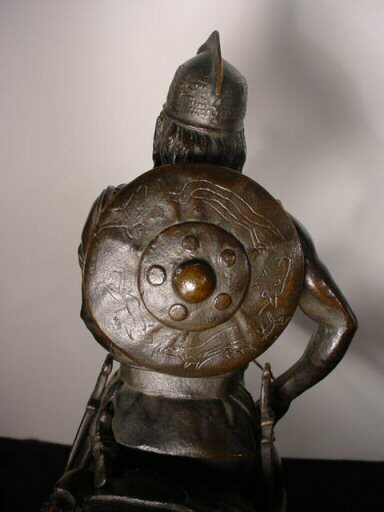 At the rear of the horse�s armor are the letters �SPQR.� This is evidence of fierce battles that were fought by the Germanic tribes against the legions of Rome. 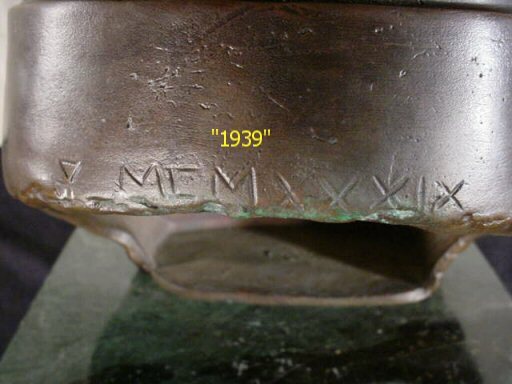 This is a captured war trophy taken by this Gaulish leader. 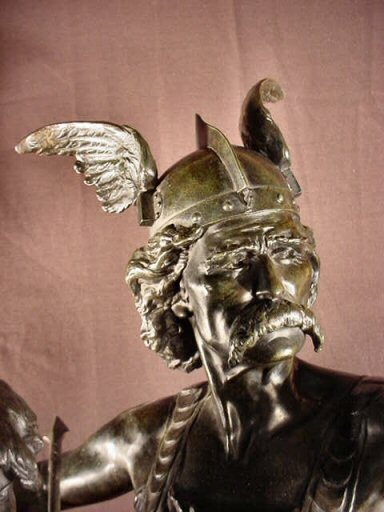 His sword, dagger, and ax are all typical of the weapons of the Germanic warrior societies. 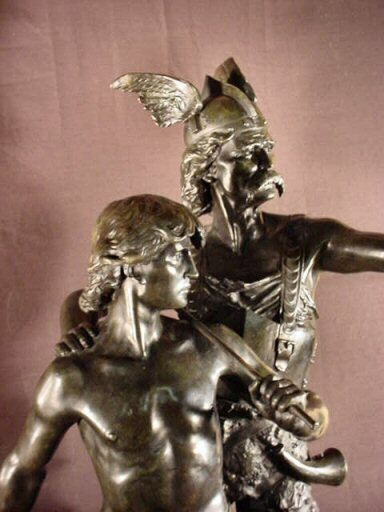 This is a very worthwhile investment for the serious collector of Germanic art. 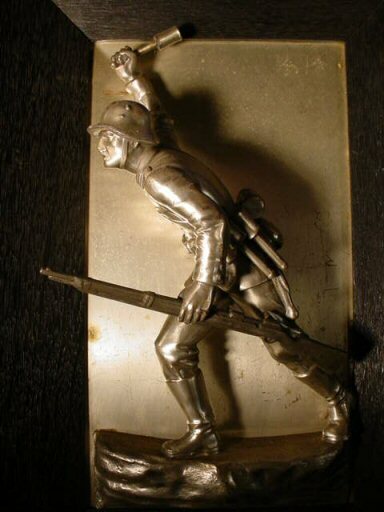 DESCRIPTION: This is spectacular!�a beautiful plaque with a World War I Storm Trooper advancing with hand grenade ready to thrust, with four more grenades in his belt (he means business!). 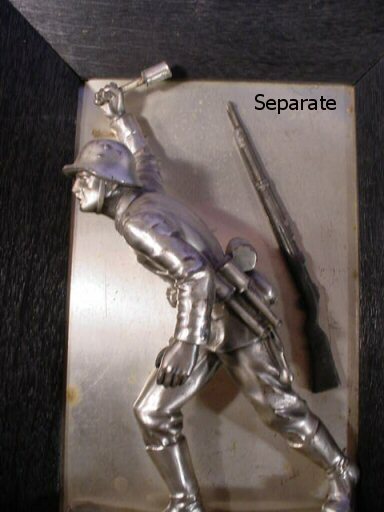 The very unusual figure is separate, but adhered to the framing while standing on a plinth that represents the battleground. 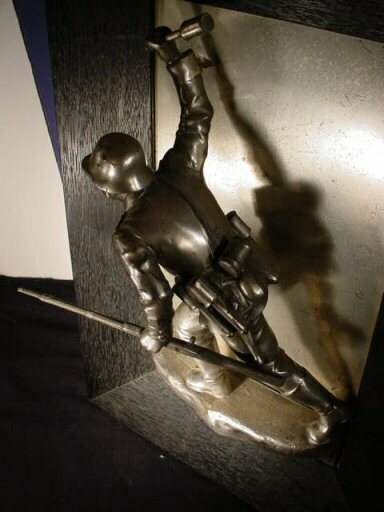 The figure has the model 16 helmet, gas mask, canteen, entrenching shovel, bread bag, bullet pouch, etc. 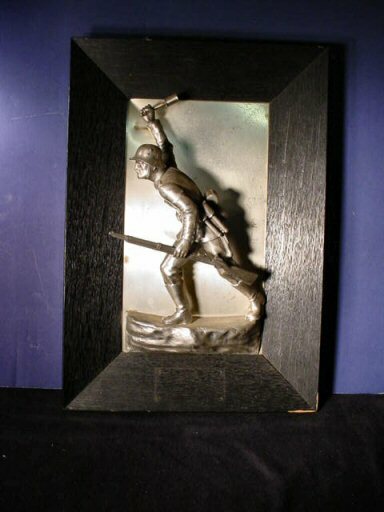 This figure is probably by a company that made many decorative items for export, because in tiny letters down at the bottom of the plants it says in English �Made in Germany,� but we are fairly sure that this plaque was made for home use. 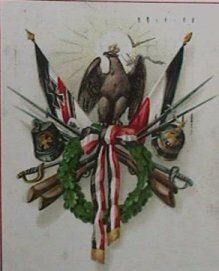 The only other possibility would be that it was for export to various buyers in the German-American Bund in the 1930s. These people bought many knickknacks with patriotic motif. 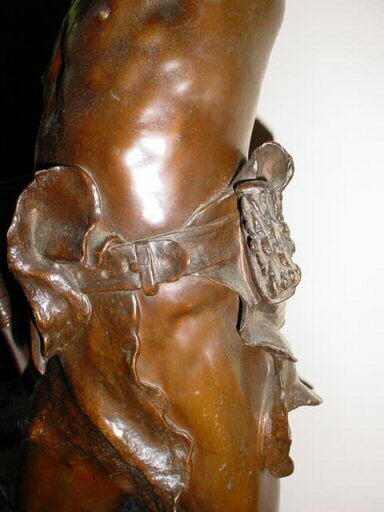 The deep-set special framing is 11 x 16 inches. 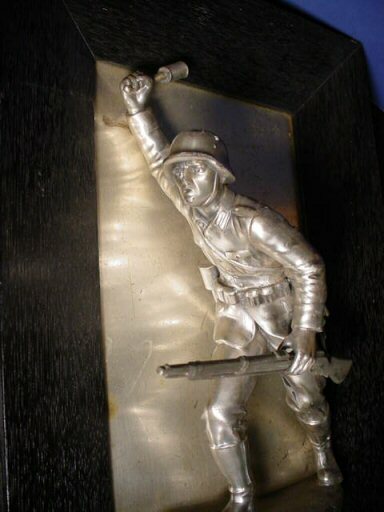 The silver background is 6 x 10 1/2 inches. 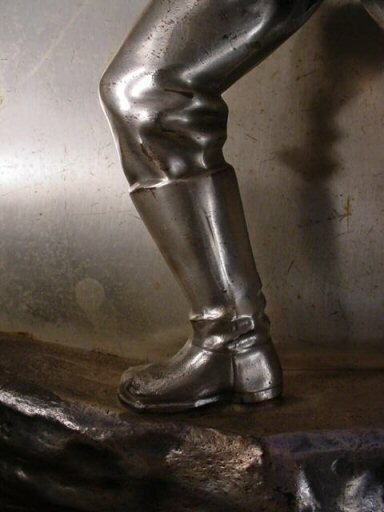 The soldier from the top of the helmet to the bottom of the combat boots is 8 inches tall. 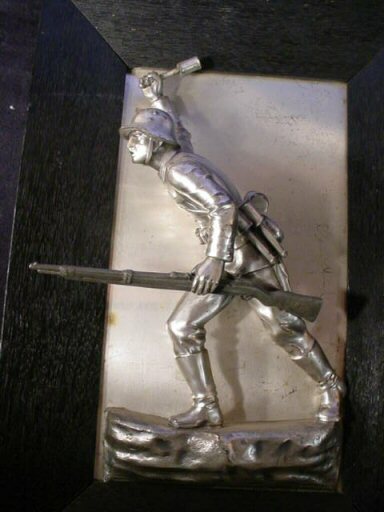 The material is white metal, or spalter, except for the rifle and that separately fits snugly into his hand and is possibly cast bronze. 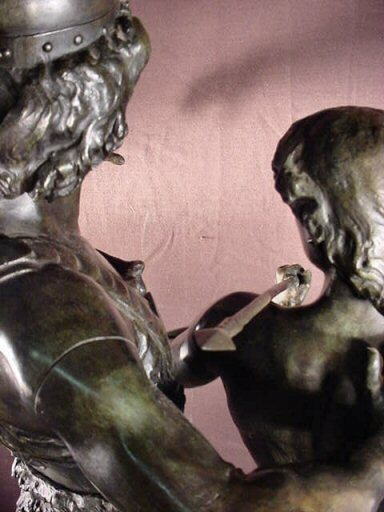 The entire piece is cleverly put together and is a highly charged ultra-dramatic presentation. 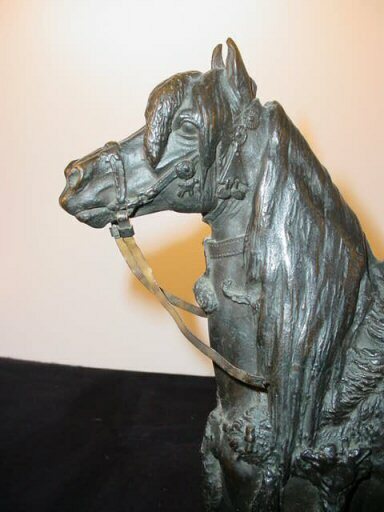 DESCRIPTION:This is incredible, and out of our personal collection! 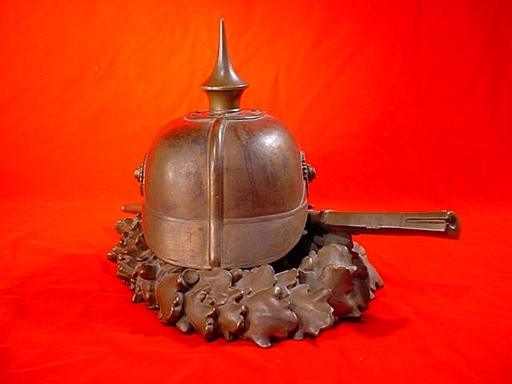 For years it was our centerpiece when we had booths at military shows. 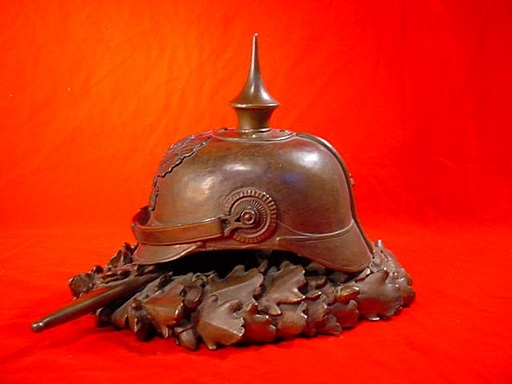 We have never seen a more accurate bronze of a German Pickelhaube, the spiked helmet of the German Prussian army. 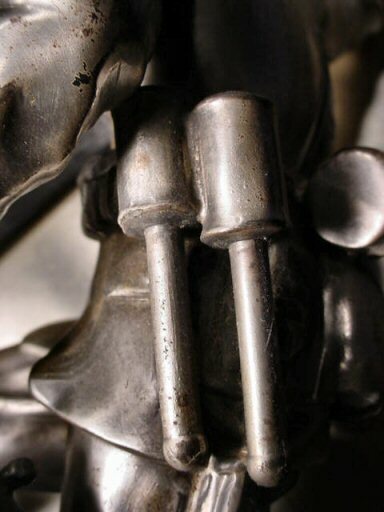 For all its long history there has never been any piece of uniform gear so recognized. 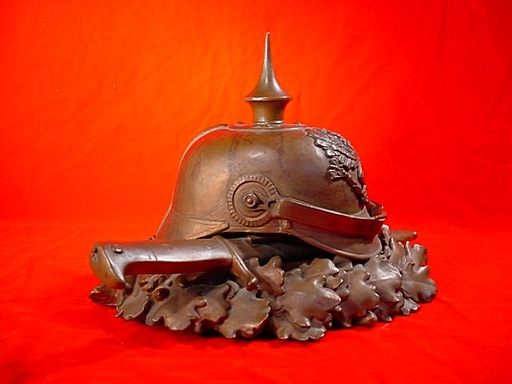 In its long history the spiked helmet has come to symbolize Prussian-ism, Kaiser-ism, Imperial Germany, and the First World War for millions of people. 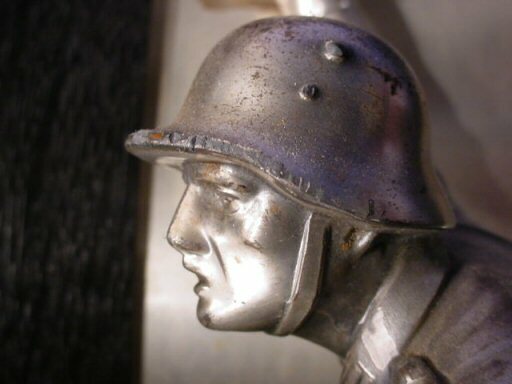 This is the most prominent feature of any collection of Imperial German militaria. 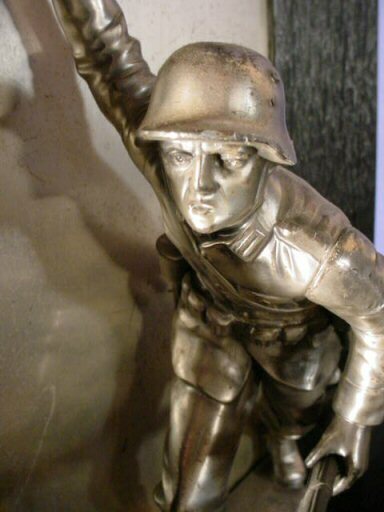 It has come to epitomize the pride and power of the German army. 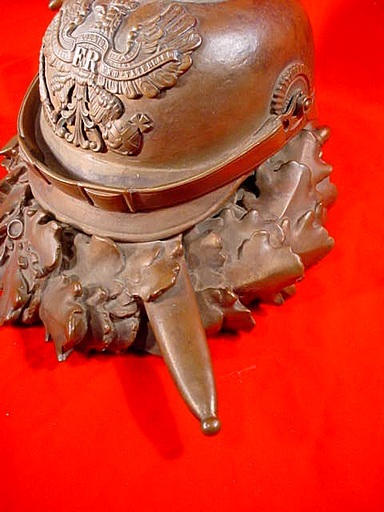 In this wonderful depiction in bronze an unknown artist has sculpted a lasting monument to this piece of headgear virtually unequaled in the annals of military history for sheer beauty and design. 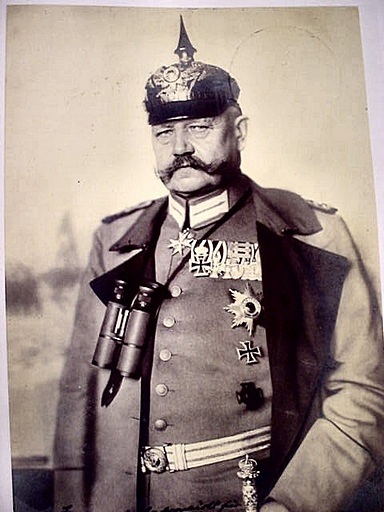 The Pickelhaube, like the Kaiser's mustache when viewed, stands as sort of �a declaration of war,� or so said his adversaries and his admirers as well. 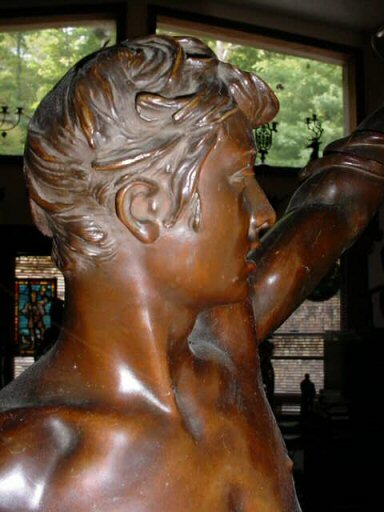 The sculpture is in pure bronze with a wonderful patina. 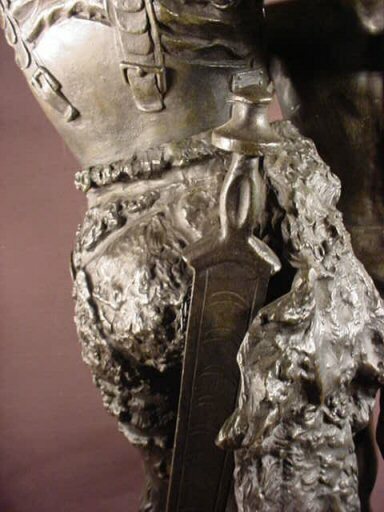 It sits on a great replicated Mauser GEW-98 bayonet and that in turn lays across a wreath of oak leaves and acorns, the symbol of Teutonic heroism and strength. 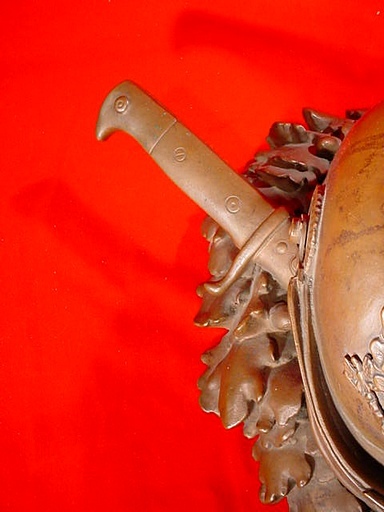 The helmet and bayonet are in full life-size (incredible!). 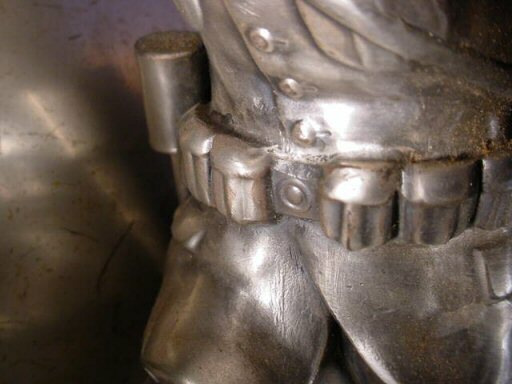 All the fittings are accurate to the nth degree. 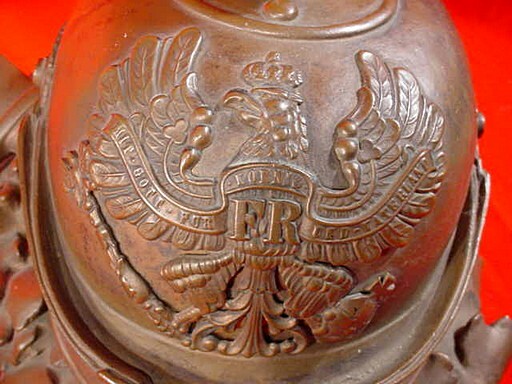 The eagle�s helmet plate is exactly like the original (size and style). 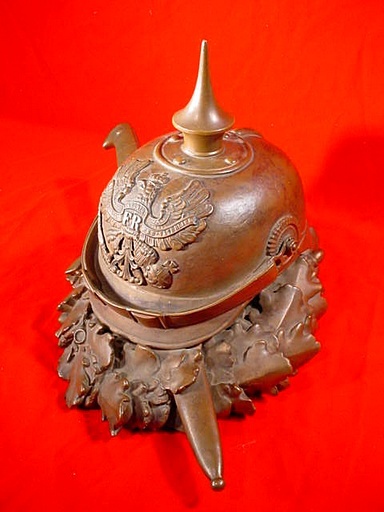 The piece was undoubtedly made for an official display, possibly in a regimental headquarters to be viewed as one would enter the building. 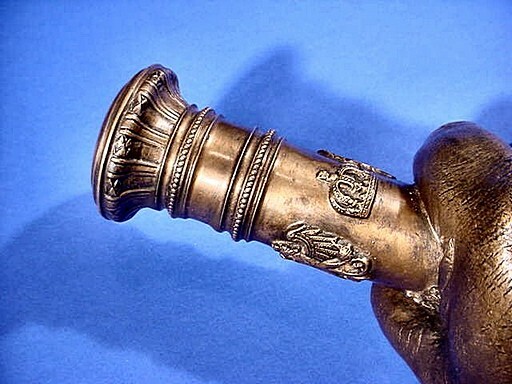 It might have been shown in a glass display case. We have observed two threaded mounting holes that are on the bottom. 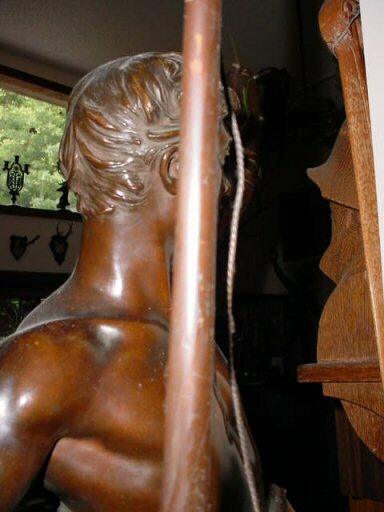 This was for attachment no doubt to a marble plinth, which obviously did not survive World War II. 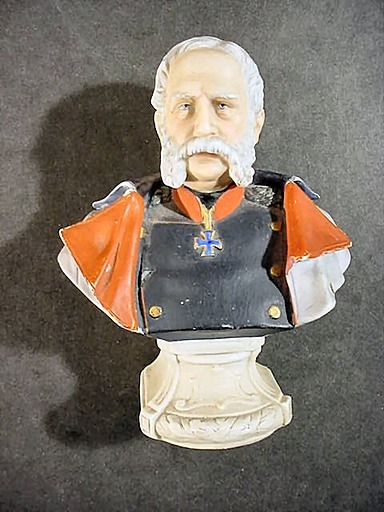 We bought this in Germany several years ago and never contemplated selling it; however, we had accumulated so many precious items in the past few years and we just have to do a turnover even if it means letting go of some of the irreplaceable items such as this. 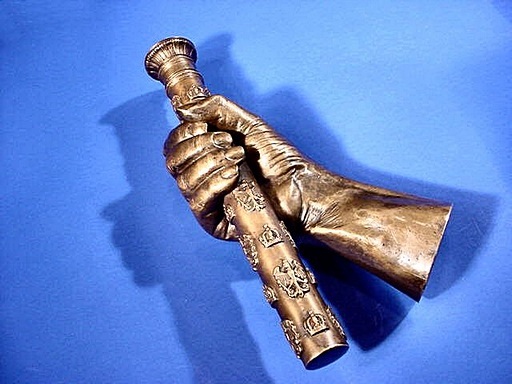 We would wager that this is unique; what more can we say? 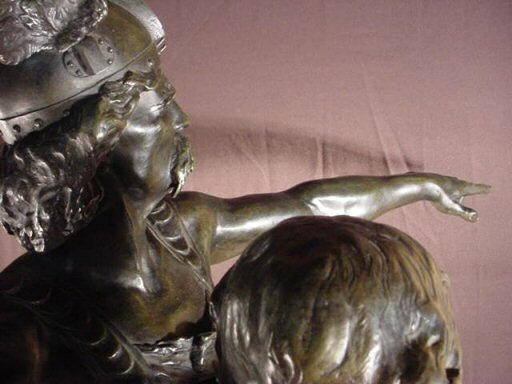 It is possibly the best bronze we have ever acquired, and we hope it gets a good home. 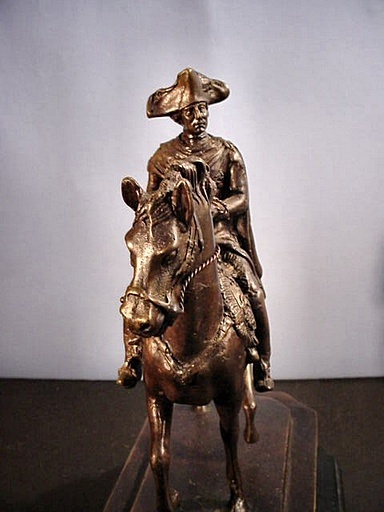 DESCRIPTION: Here is a beautifully executed genuine bronze of �Der alte Fritz,� as King Frederick II of Prussia was known in his senior years. 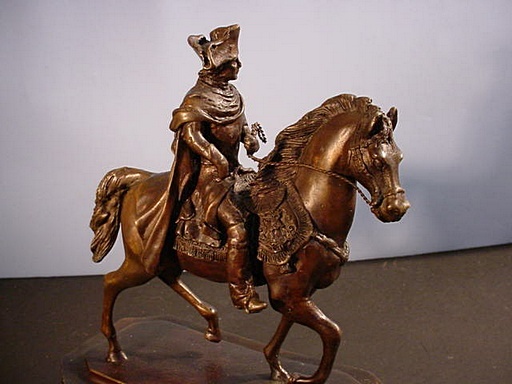 He was known as one of the most enlightened monarchs in European history. 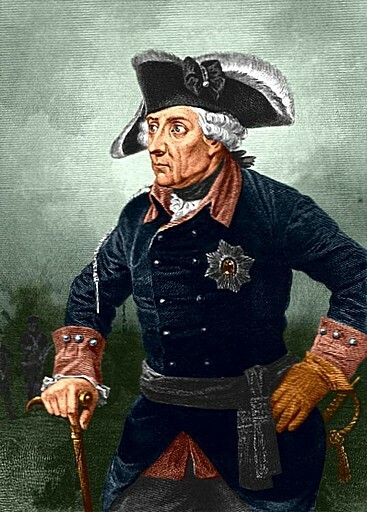 He was King of Prussia from 1740 to 1786 and was of the Hohenzollern Dynasty, Prince Elector of the Holy Roman Empire. 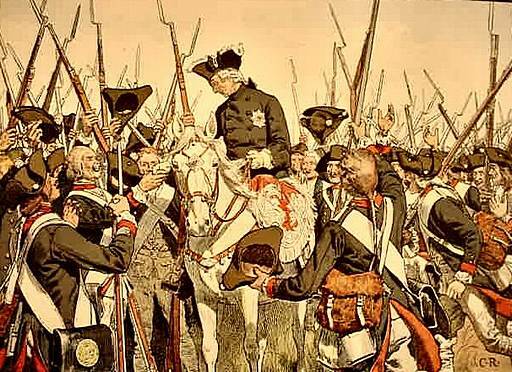 He truly did fit the title of Frederick the Great. 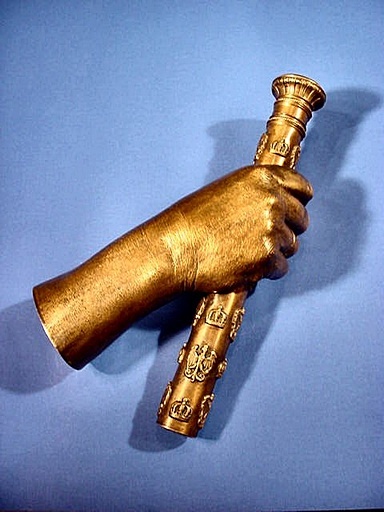 Much about the great King can be found on the internet. 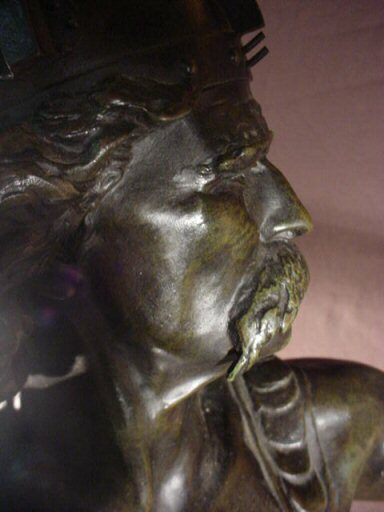 Do look at all our other Frederick offerings on these pages. 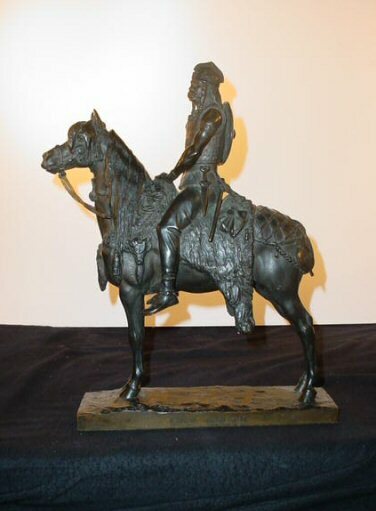 This statue in bronze is wonderfully detailed with a beautiful patina. 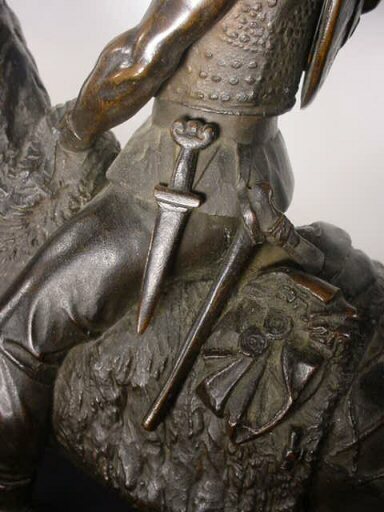 It's mounted on a fine granite plinth, and just above this is a bronze plinth with 18th-century-style detailing with female figures at each axis. 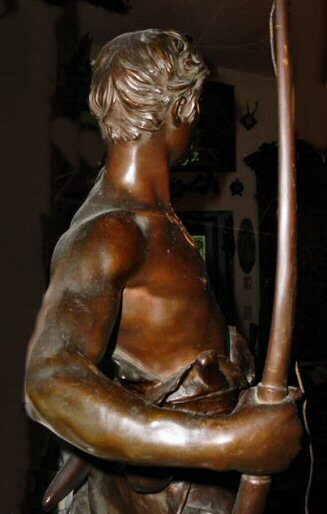 It's almost identical to the huge statue of Frederick by C. D. Rauch in 1851, one of the greatest sculptures of the 19th century. 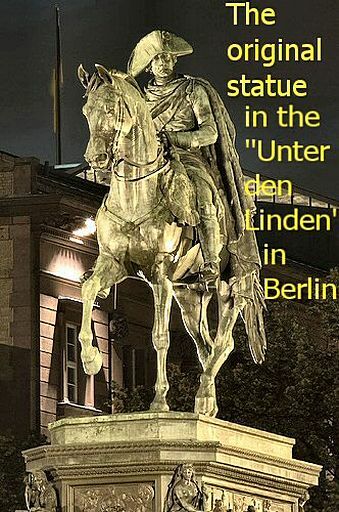 The huge equestrian stands in the middle of Berlin's �Unter den Linden.� The statue we have and the Berlin statue depict the King riding on his favorite horse Cond�. 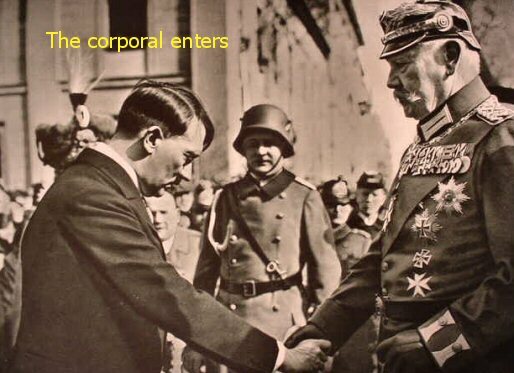 Around his shoulders are his coronation robes. 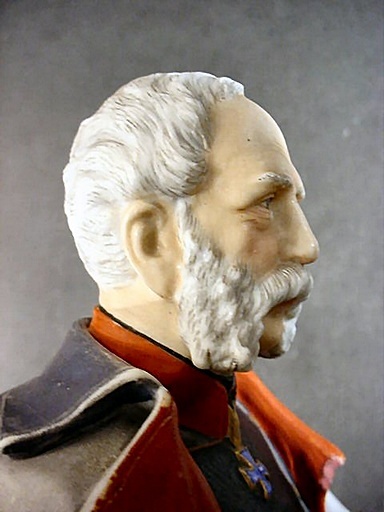 The major difference is that while the original's base has the life-size figures and men of politics, art, and science, the small statue we offer has a much more humble base. 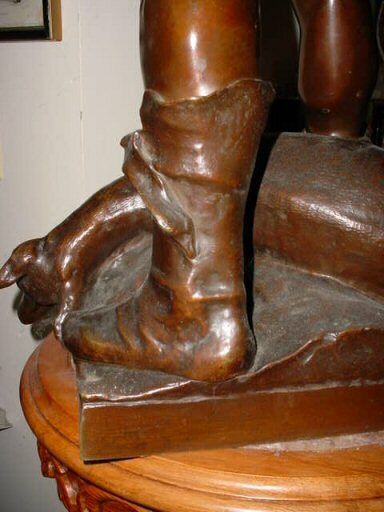 But the word humble definitely does not apply to the statue itself. 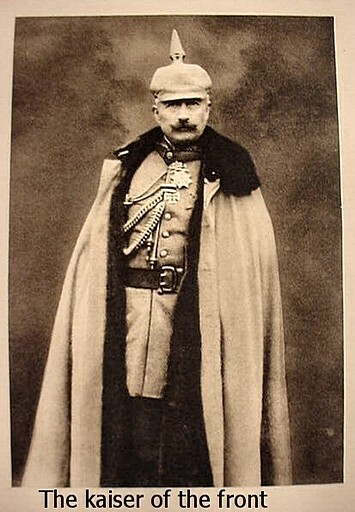 It is bold and dramatic, just as Frederick himself was. 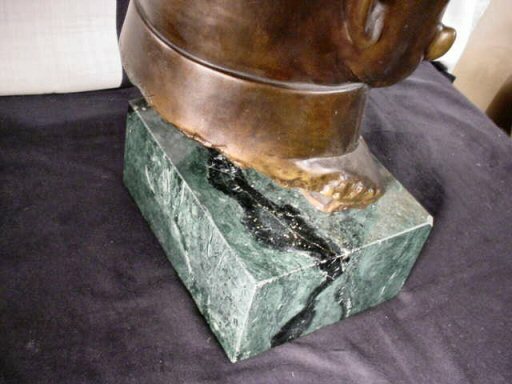 The sculpture measures 10 inches high from the bottom of the granite to the top of his three-cornered hat. 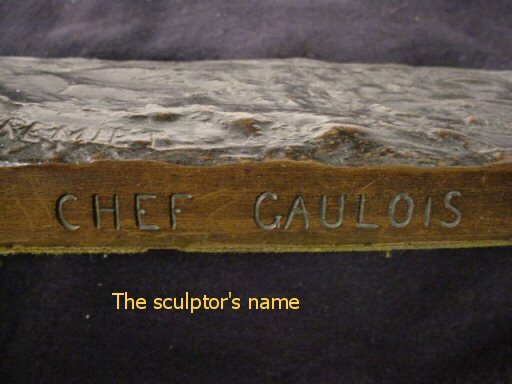 The granite base is 9 inches long and about 5 1/3 inches wide. 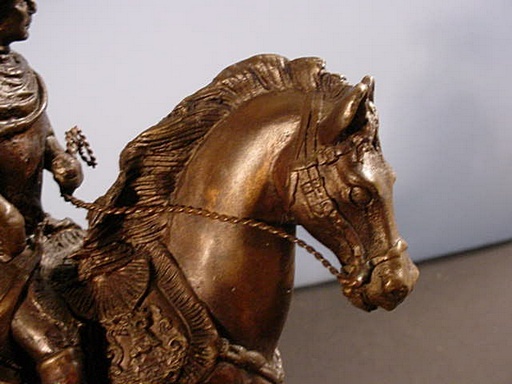 The horse measures about 7 inches from the tail to snout. 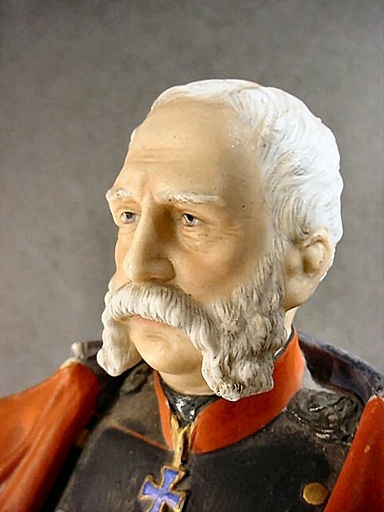 The face and uniform look good under normal visage and inspection, but shows a bit of caster�s blemish here and there. 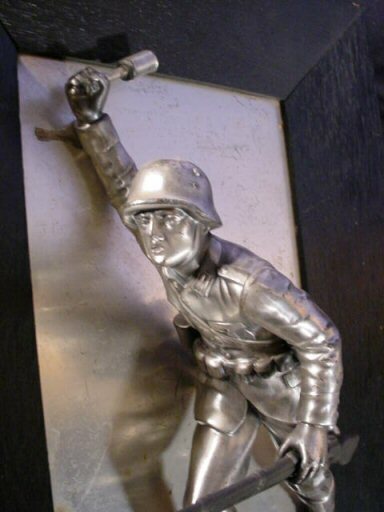 All in all this is just a really great sculpture and one that you will be exceedingly proud to place on your desk or mantle. 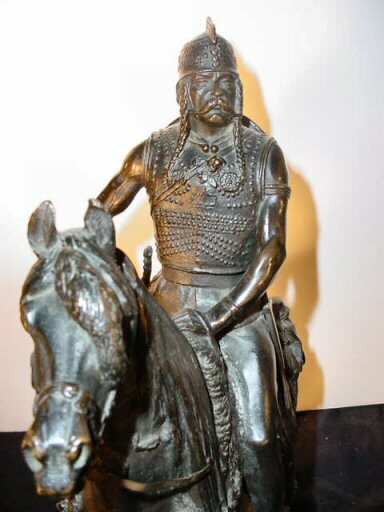 This is a great tribute to a great statesman and warrior! 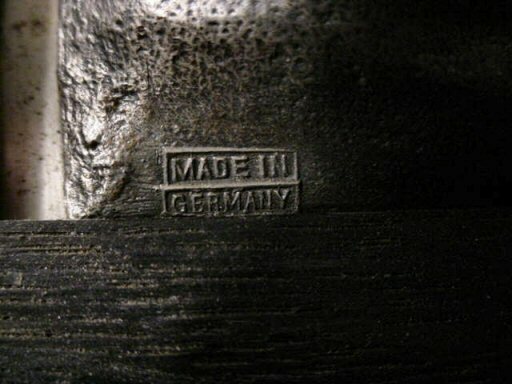 DESCRIPTION: This is one of the most historically important relics we have ever offered on Germania�s site. It�s practically unique and as far as we know only a handful have ever been made and we know of only two in existence or on display (ours is one of them). 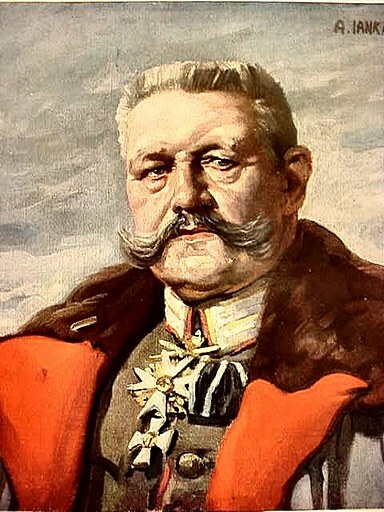 The depiction is the right hand of Paul von Hindenburg, the WWI German Army Chief of the General Staff and Grand Marshal of the Reich. 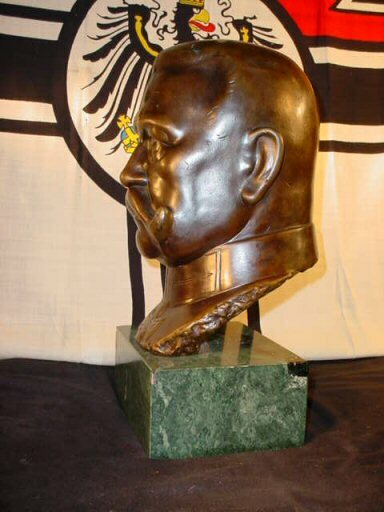 We have reason to believe that this one was presented to Dr. Otto Meissner, 1880-1953, who was State Secretary serving under Hindenburg when later the aged marshal was appointed as the postwar Reich�s president. 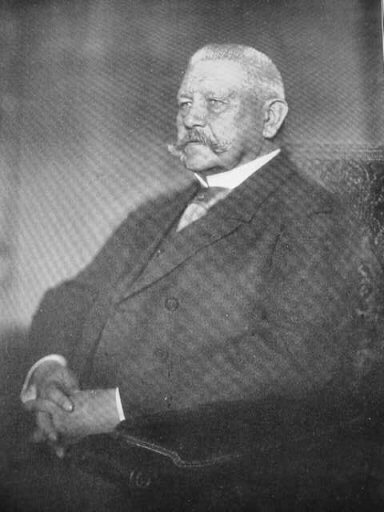 Meissner was in this capacity from 1924 to 1945. 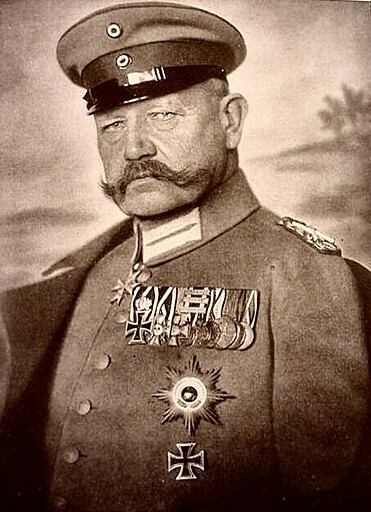 He was a personal close friend of Hindenburg even back in the days of the Great War. 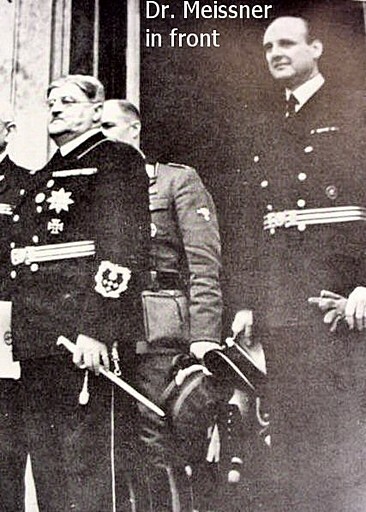 When Adolf Hitler came to power he gave him the title of Reich Minister of the Greater German Reich and kept him doing the work he was so proficient at doing. 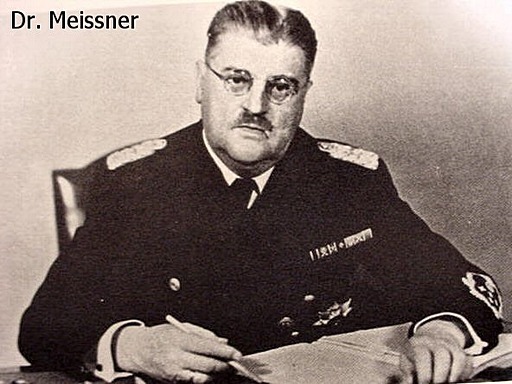 Meissner was always the bureaucrat�s bureaucrat. 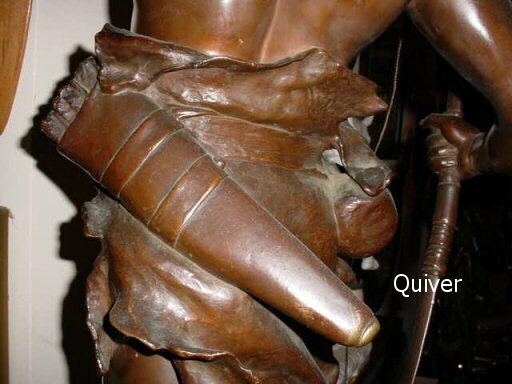 Now to this remarkable sculpture. 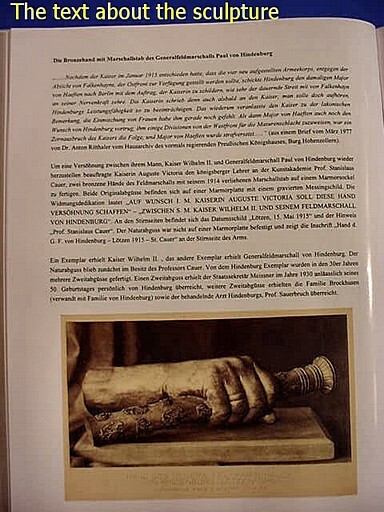 There is a fascinating story connected to it and it is written up in a beautiful book out of Germany entitled �Mythos Marshallstab� der Marschallstab in der Preussischen un Deutschen Geschichte von 1852 bis 1945. 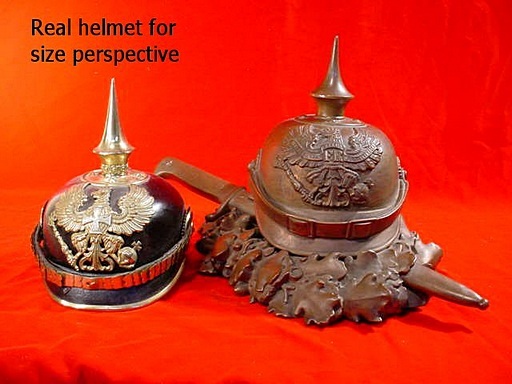 This is a 360-page book (now practically unavailable) that gives the history of the marshal�s batons of Prussia and Germany from 1852 to the end of World War Two. 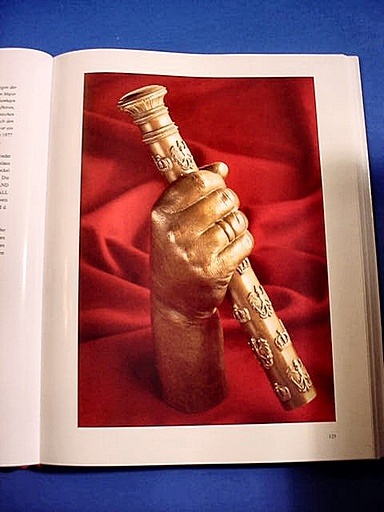 The book is incredible with beautiful pictures of the batons and their owners through the many years. 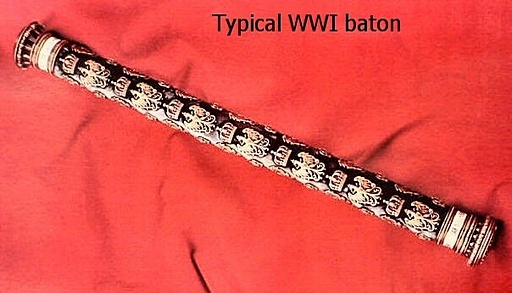 On pages 124 and 125 there is a picture of the style of baton that we now present. 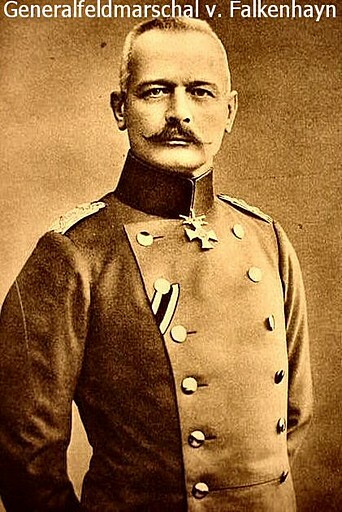 The legend goes�the German Kaiser of Prussia and Emperor of Germany had summarily declared in January 1915 that four new army groups were to be earmarked to be deployed on the eastern front against the recommendation of an officer, Erich von Falkenhayn, 1861-1922, who was then chief of the general staff. 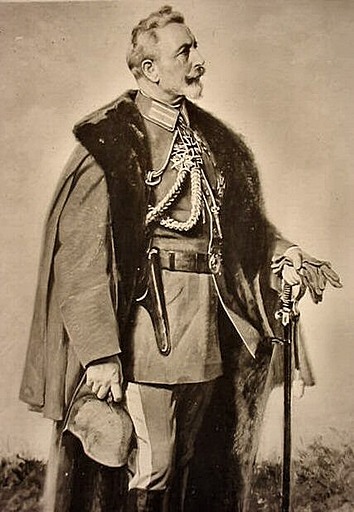 Hindenburg therefore sent Major von Haeften to Berlin to pass the word to the empress Augusta Victoria that the constant disagreements with Falkenhayn were becoming unbearable. 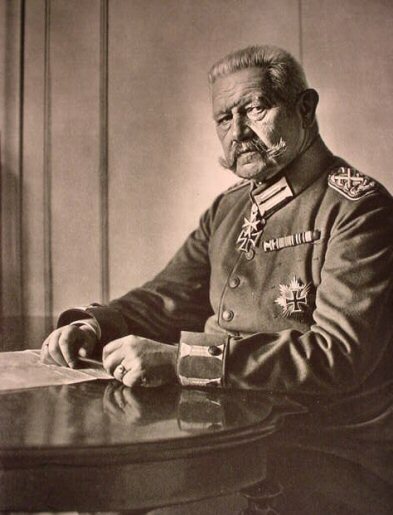 The empress, after hearing this report, wrote a letter to the emperor asking him to intervene to stop Falkenhayn�s meddling in the ability of Hindenburg to run the war in the east. 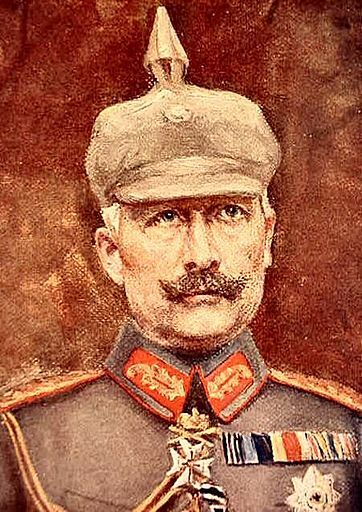 The emperor�s remark about the letter from the empress thereupon was: �That�s all we need now, women meddling into this affair.� When Major von Haeften suggested the transfer of at least a few divisions from the western front to stem the Russian attack in the Masurian Lakes area the Kaiser was livid and angry and he had v. Haeften transferred to a penal unit. 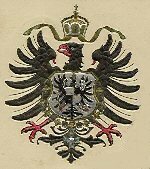 This is seen in a letter of March 1977 from Dr. Anton Ritthaler from the archives of the house of the kings of Prussia (Hohenzollern Castle). 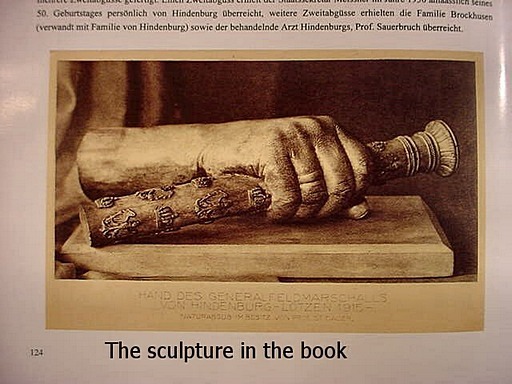 Then it came to pass that the empress Victoria to heal the rift that resulted from all of this between Kaiser Wilhelm II and Field Marshal Hindenburg ordered the K�nigsberg teacher in the Academy of Fine Arts professor Stanislaus Cauer, to create two bronze, sculpted hands holding a depiction of Hindenburg�s marshal�s baton that he had been awarded in 1914 after the victory at Tannenberg. 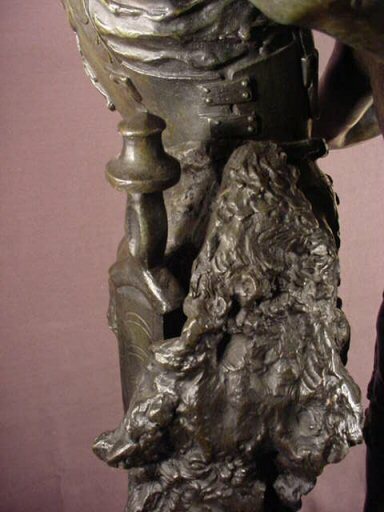 Both of these original bronzes are mounted on a marble slab with a brass plate and inscribed: �It is the wish of Her Majesty Empress Auguste Victoria that this hand be a sign of renewed friendship between his majesty Wilhelm II and his great Field Marshal von Hindenburg.� At the end of the sculpture is an inscription that reads the date and L�tzen May 15, 1915 St. Cauer.� One of the castings was presented to Kaiser Wilhelm II, while the other was presented to Hindenburg. 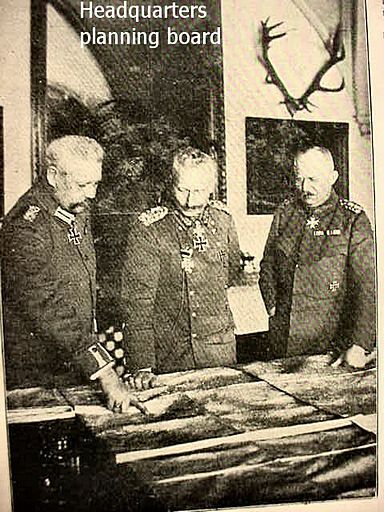 The original template cast, however, stayed with Prof. Cauer. 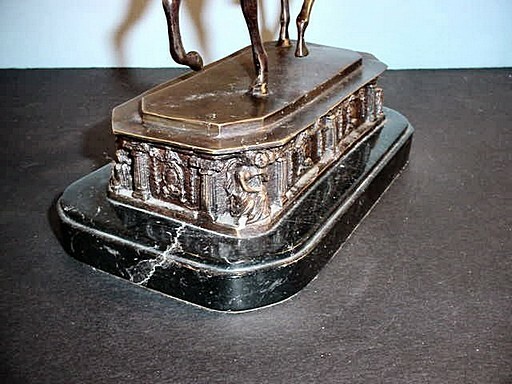 In the 1930s some more bronzes were produced using the same die or template cast. 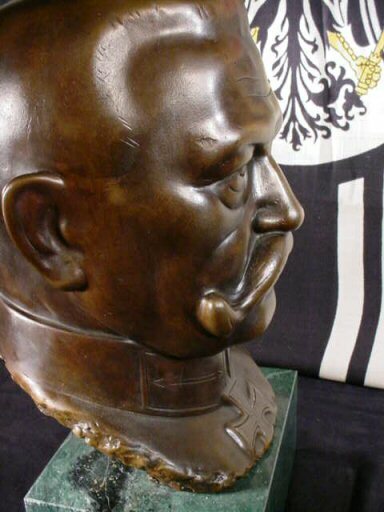 One was given personally by v. Hindenburg to State Secretary Meissner in 1930 on his 50th birthday. 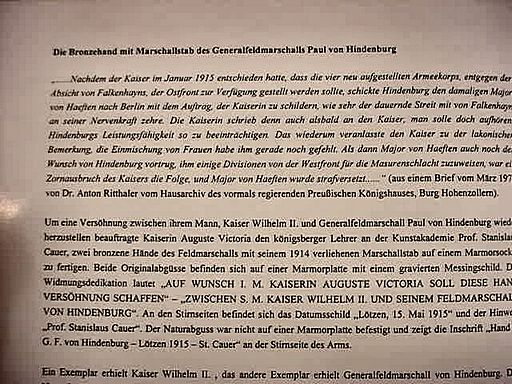 Other recipients were the family of Brockhausen, relatives of v. Hindenburg and one to Prof. Dr. Sauerbruch*, and one to Ludendorff. 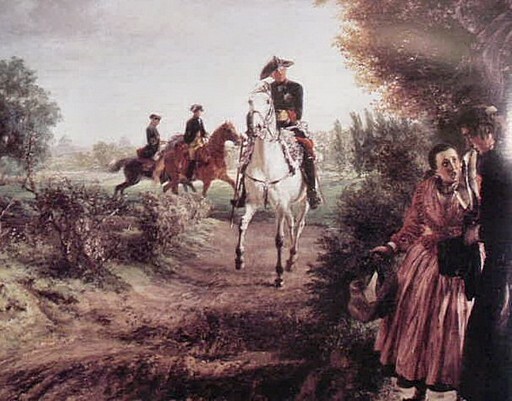 The name L�tzen in the inscription refers to a town in the former kingdom of Prussia. 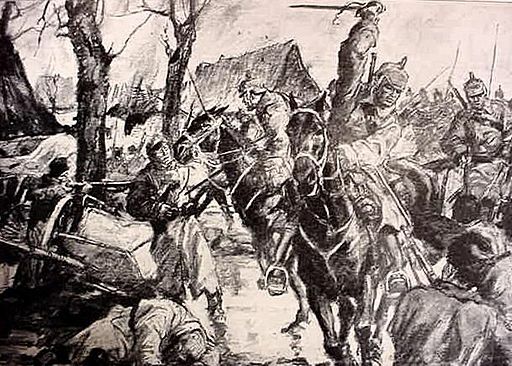 This was the place where the famed Teutonic knights built a mighty castle and fortress in 1340 located at the isthmus between the two Masurian Lakes. 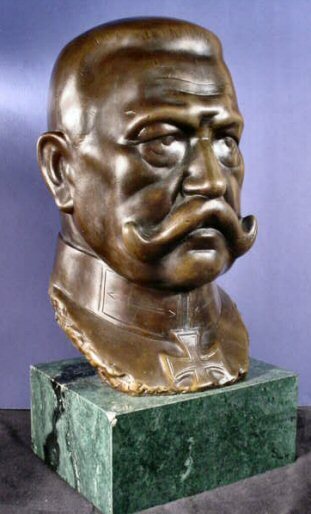 We think it highly interesting that this was the place of presentation of the sculpture to v. Hindenburg as it was also the place where the disagreement was born!!! 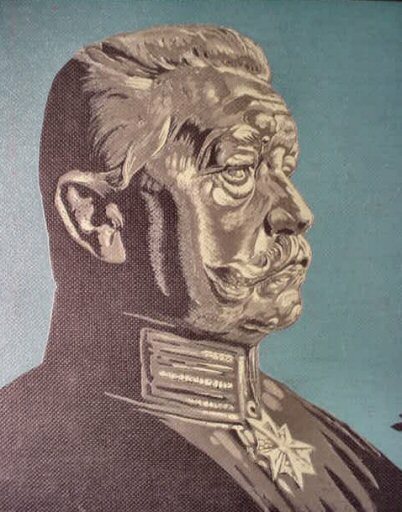 All in all, this is a very fascinating relic of war, majesty, honor, and nobility; a tribute to the grand Kaiser and marshal and to the seemingly clever yet kindly act of a sovereign empress. 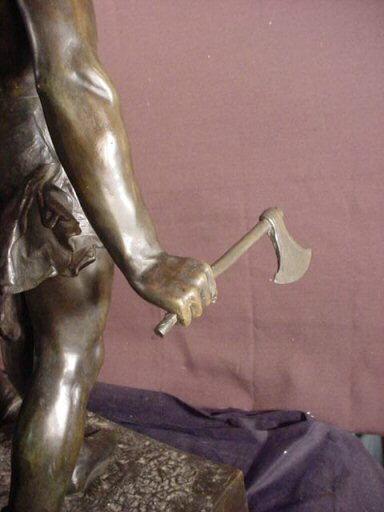 The sculpture measurements are with the hand and arm 9 inches. 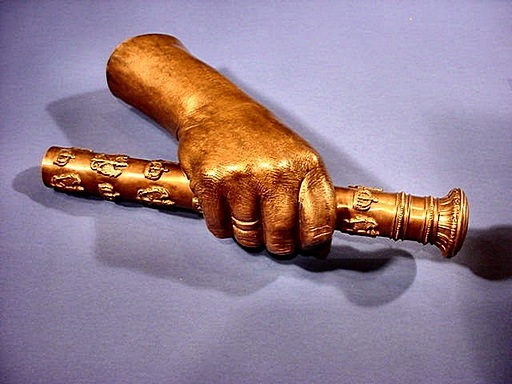 The baton is 12 inches long. 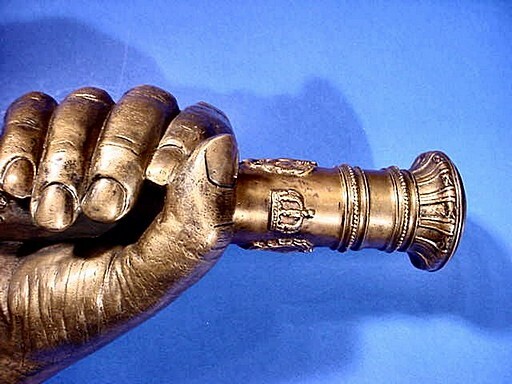 The thickness of the wrist portion is about 2 1/2 x 3 inches; a semidiameter. 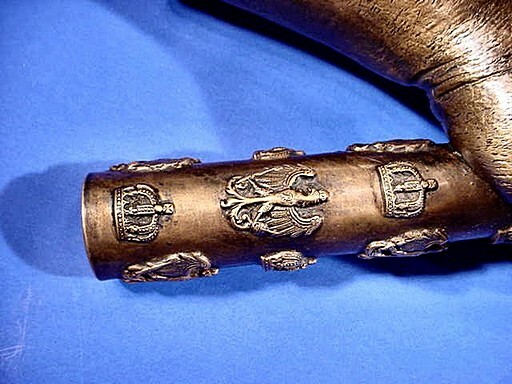 The baton is decorated with depictions of the Prussian eagle and the Hohenzollern crown. 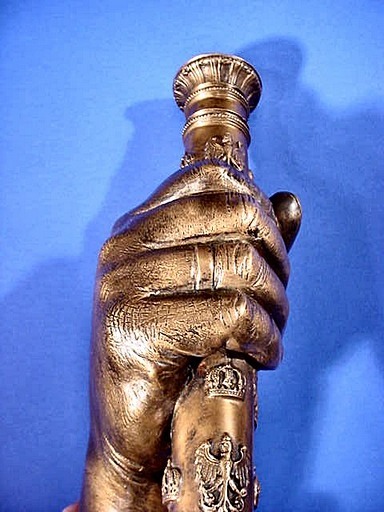 They say that the hardest thing for an artist to present faithfully is a hand. 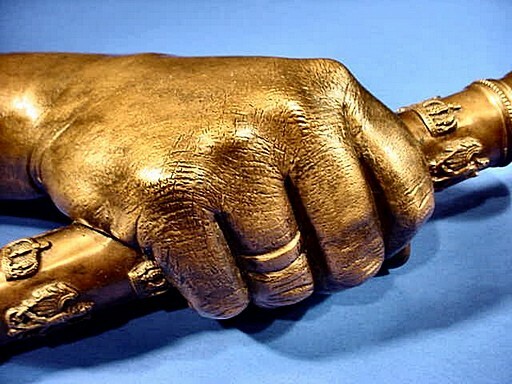 Well, Prof. Cauer must have surely been one of the greatest of bronze sculptors as this hand is as near perfect as can be done (our opinion). 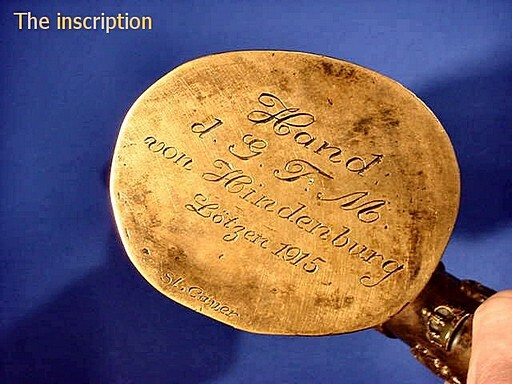 The inscription on the end says: �Hand d. G.F.M. 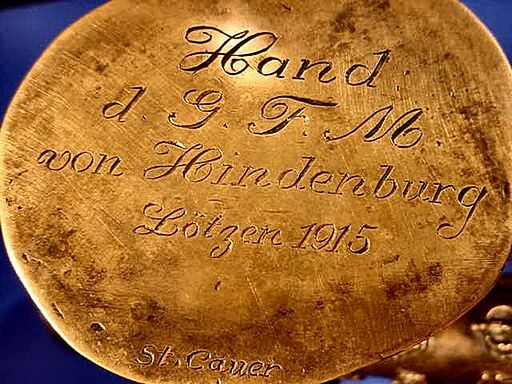 von Hindenburg L�tzen 1915.� The initials are for �die General Field Marshal von Hindenburg� and of course as previously mentioned L�tzen was the town where the presentation took place. 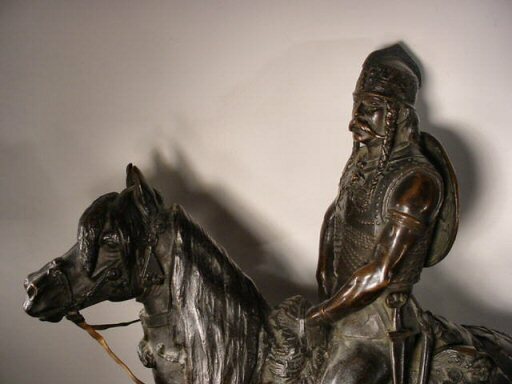 Many of his works can be found in state collections, public memorials in Halle, K�nigsberg and Kreuznach. 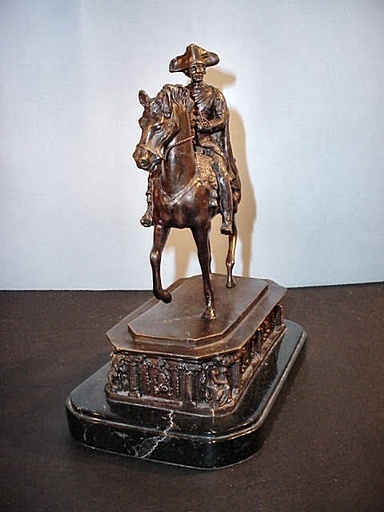 The buyer of this great historical treasure will be most fortunate as this is history personified! 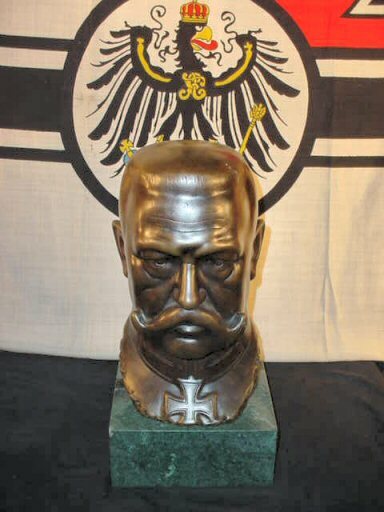 This is a great and of course prodigiously rare item of glorious Teutonic history. 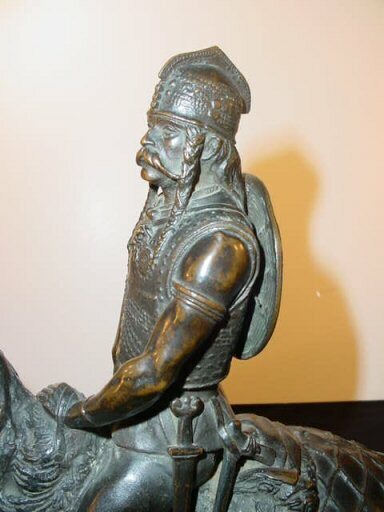 Just imagine this one on your office desk! 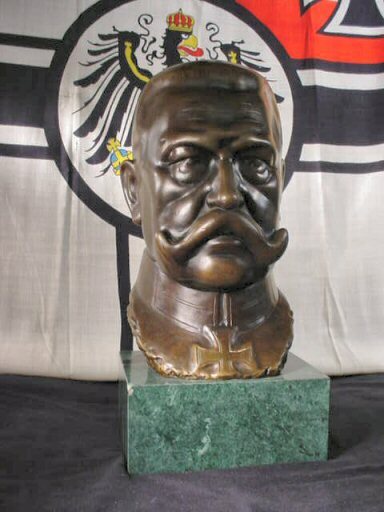 It really should be in a museum, but we know you will provide a good home for it until the day comes when it will repose in a German museum collection. The story is fascinating and the piece is dramatically important. 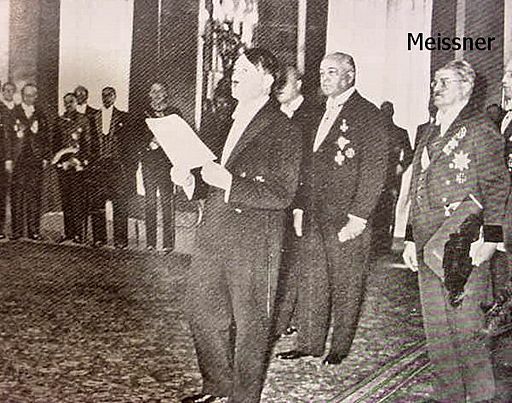 *Dr. Ferdinand Sauerbruch was the Reich president�s personal physician and the country�s leading surgeon. 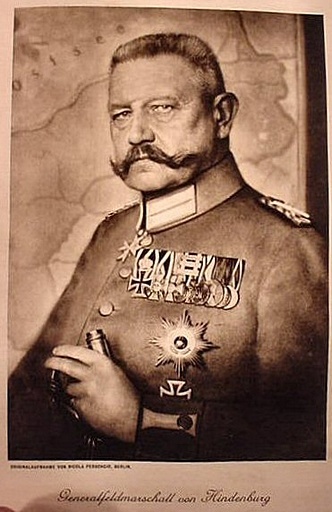 He was also Adolf Hitler�s personal physician, as well. 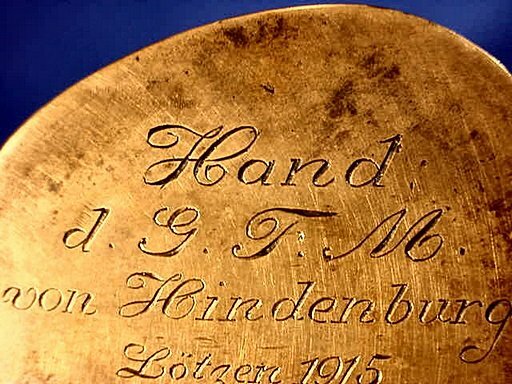 The doctor was also a physician in attendance with other doctors when SS-Gruppenf�hrer Reinhard Heydrich was operated on unsuccessfully and Germany lost the man who might well have won the war for the Fatherland and for Europe. 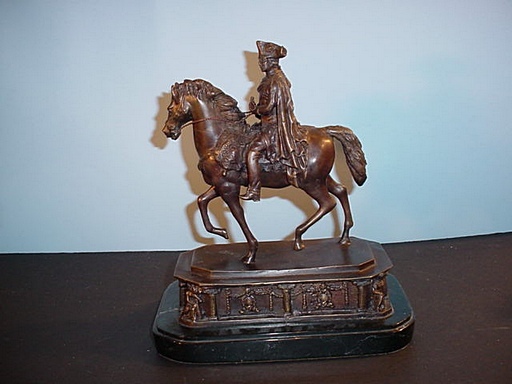 DESCRIPTION:This is one of the most lifelike figures that has been our pleasure to behold. 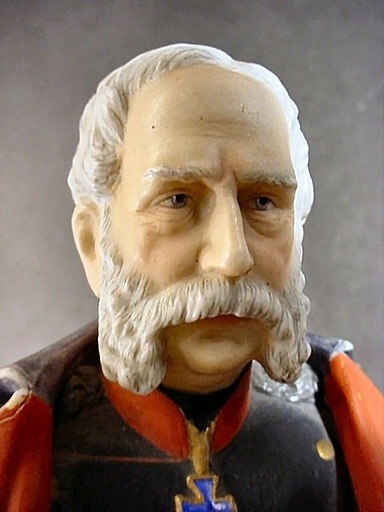 This gentleman is so accurate in physiognomy that he almost could breathe. He is as realistic as Madame Tussauds� wax figures, even thought he is in porcelain. His hair, beard, clothing, are just real!!! Or so it seems. 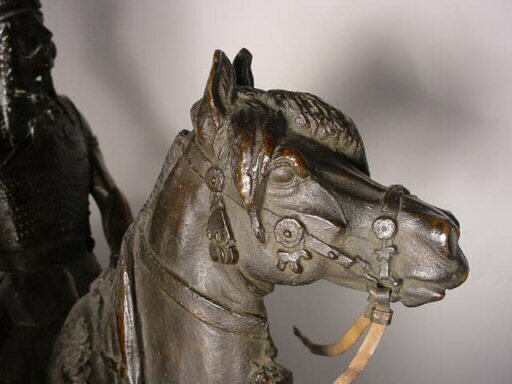 We don�t know who we are looking at, however, and we are still researching so if you have an idea we will truly appreciate any help in the matter. 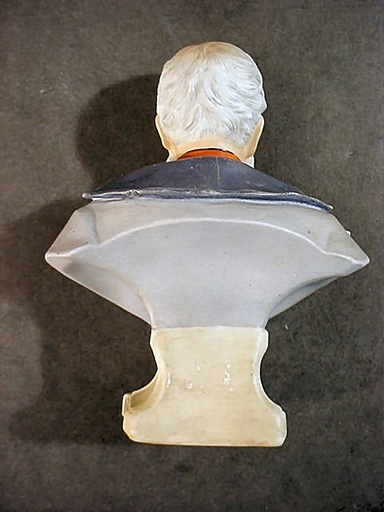 It measures 5 1/4 inches high and 4 1/4 inches across the shoulders. 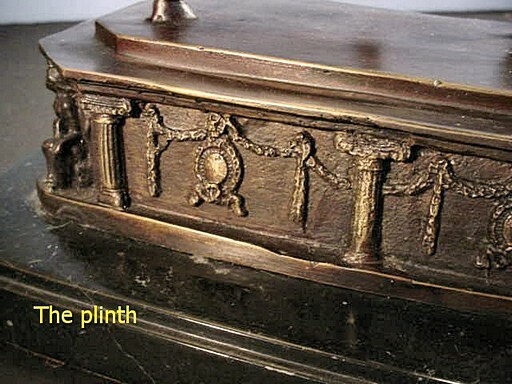 The plinth is 2 1/2 inches wide. Please! 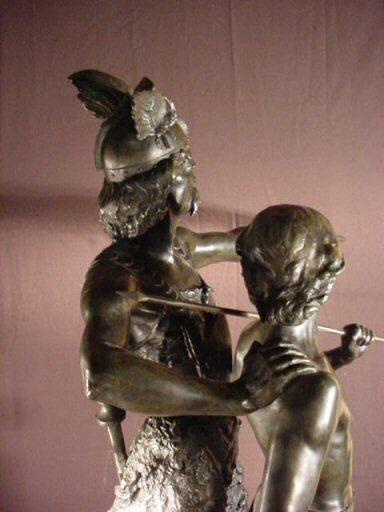 do not call during the wee hours of the morning. The best time for calling us is between 10and 11 am and between 9 and 11 pm eastern time.